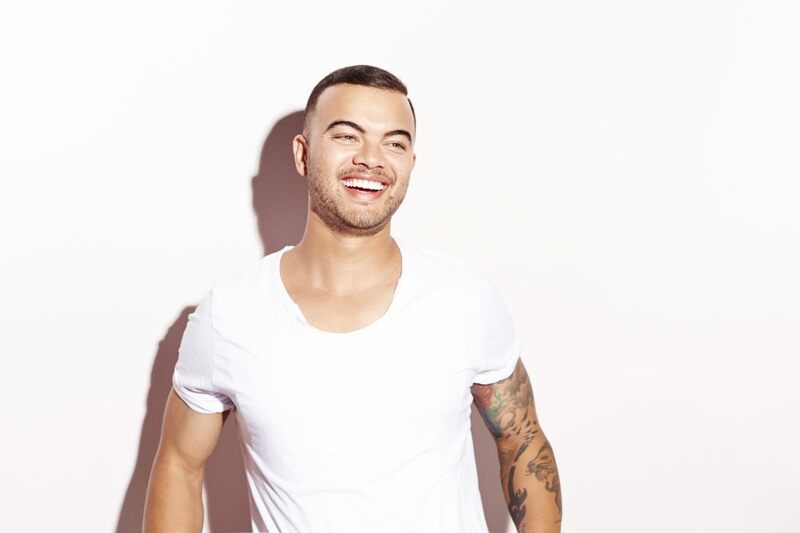 Into the final furlong now with seven more songs that by virtue of their parentage or previous success have made it direct to the Saturday night spot without having to appeal to the midweek crowd as well. As the performance order is not yet decided I’m going to take them in alphabetical order. (I know, I’m so conventional.) Again each preview will have its own star rating and its bookmaker odds courtesy of oddschecker.com, as at 13th May. You know you want to. 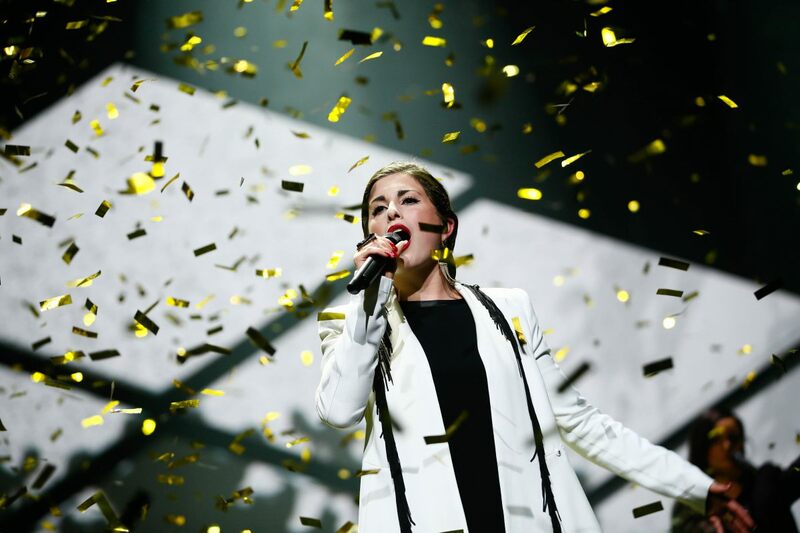 As ever, I do a little counting up of the number of hits each song has received on the Eurovision.tv youtube channel, not that it means anything at all on previous experience. Last year Conchita’s song came 2nd in this table, second and third placed Netherlands and Sweden were not in the top ten and Armenia’s fourth placed Aram MP3 came top of this table. 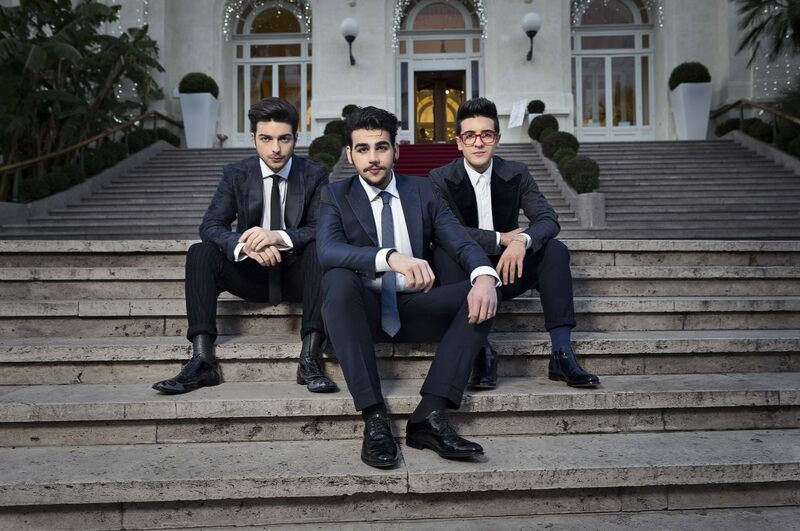 Azerbaijan, Italy, Spain and the UK were also in the top ten of youtube views, just as they are this year. The big difference this year is the massive number of views for Polina Gagarina. Do those Russians know something we don’t? Have a great time watching the show on May 23rd, wherever you are – at home with some crisps, at a party, or in Vienna. No doubt we’ll have some kind of post-mortem at the end of May. 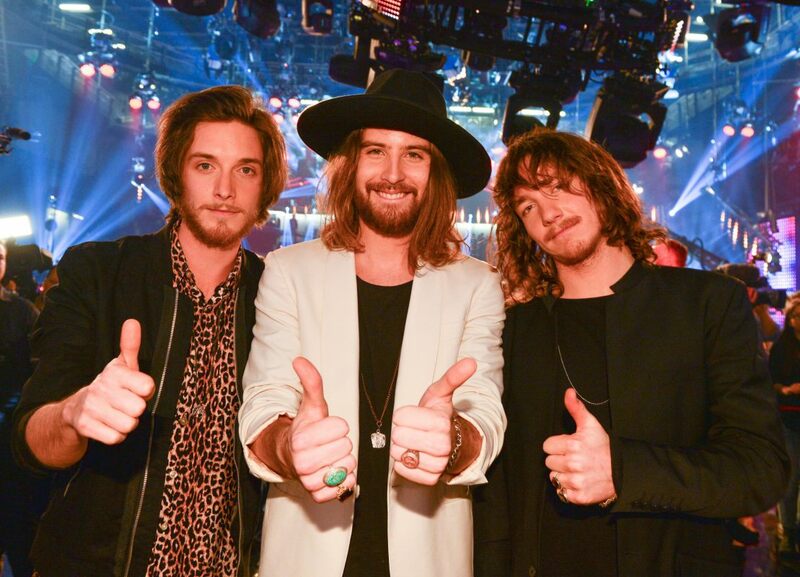 May the best song win! If you cast your mind back to February, gentle reader, I was telling you all about a Mediterranean cruise that Mrs Chrisparkle, I, and several relatives embarked on just before Christmas. Since then, we’ve been to India, to South East Asia, we’ve seen lots of shows, and been generally very busy; and those two last days on our cruise have been ignored. So I’m about to put that right! When the ship docks at Palermo, you’ve got a wide range of tours you can do round the island of Sicily, but we prefer just to get off and walk around. Although it was December, it was a beautiful sunny day; and maybe the sun just got in our eyes a bit too much because within fifteen minutes of walking around we were completely lost. My map was a bit rubbish, not to scale and it didn’t show where we started from, and I quickly concluded that we weren’t anywhere near where I thought we were. 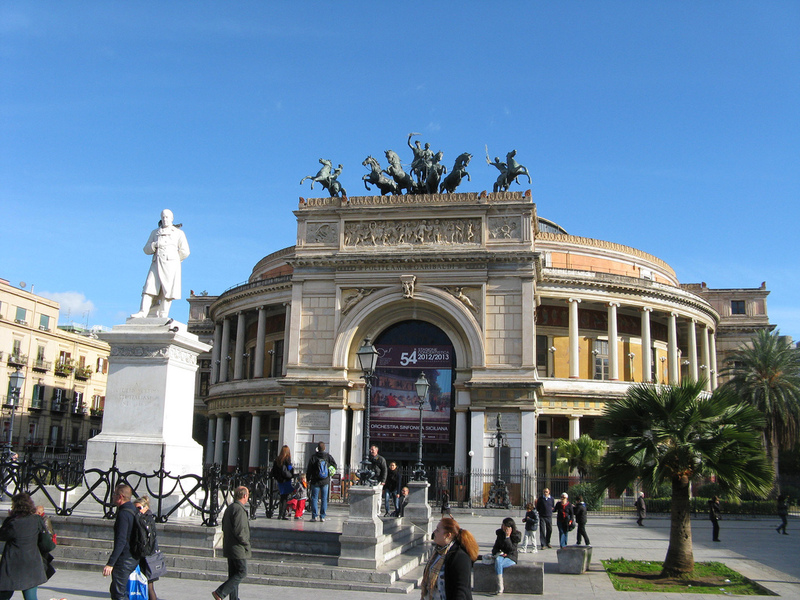 So it was by pure chance that we stumbled across the Politeama Garibaldi theatre, home of the Orchestra Sinfonica Siciliana, built in 1874, and looking extraordinarily like a mini Albert Hall. 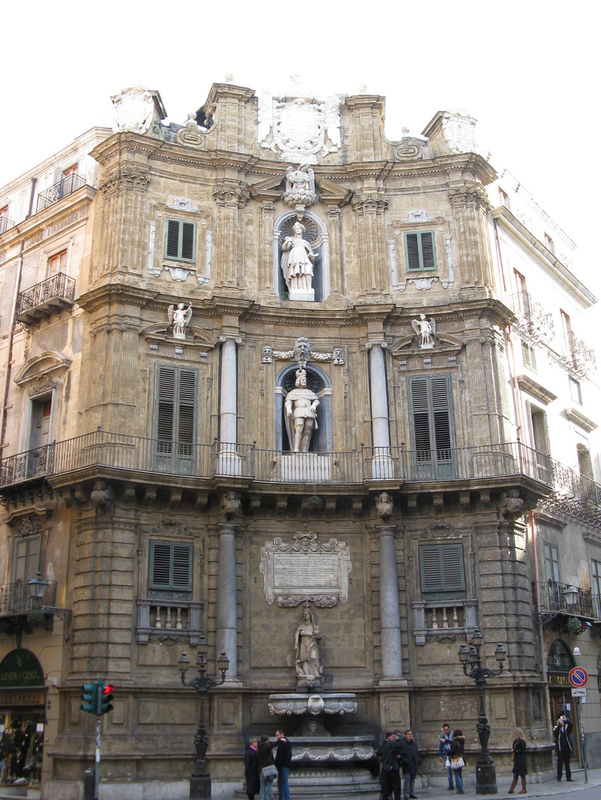 It faces a rather grand square, which features a statue of Ruggiero Settimo, Sicilian patriot and fighter for independence. The area has a jolly feel to it – tourists and shoppers mingling with local families and workers on their lunch break. 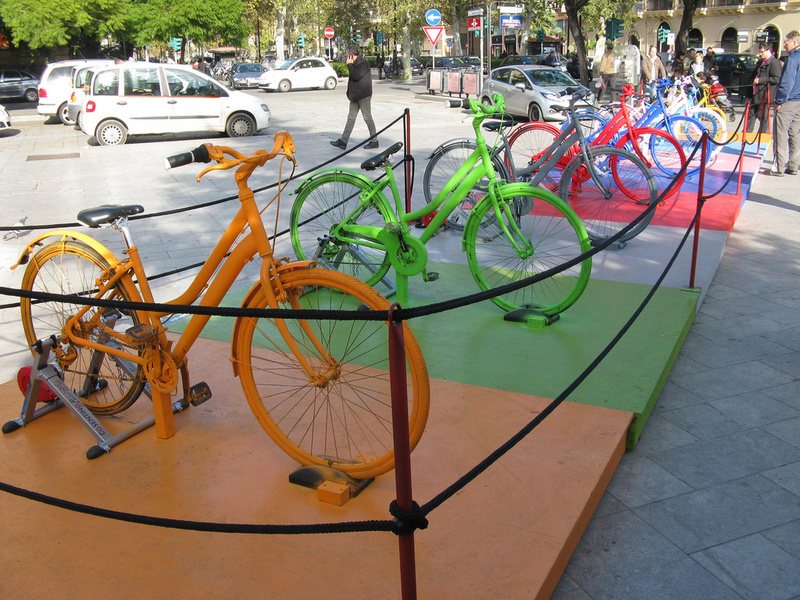 What also impressed me was a display of civic art that you could use to keep fit – a row of static bicycles in multi colours, all mounted on a bright platform. Anyone who gets on and does a bit of pedalling becomes part of the installation, so in a sense it’s a constantly changing display. Clever, that. 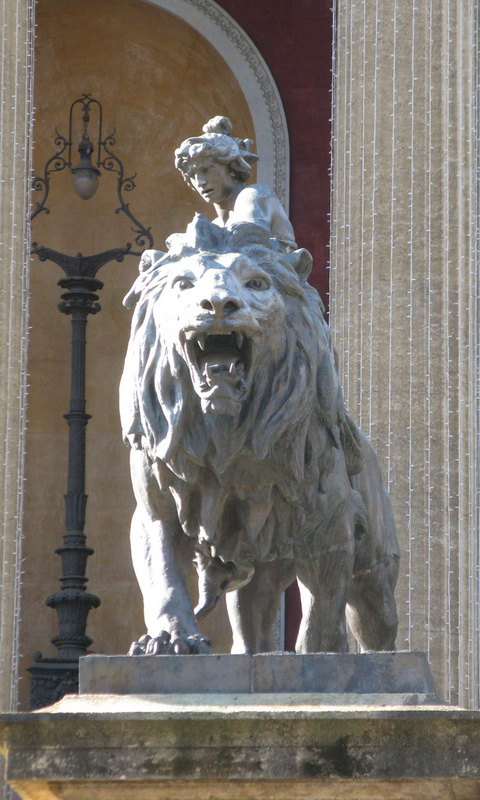 We walked on, and eventually (after having gone in the wrong direction, again) found ourselves being growled at by a lion (not a real one) outside the Teatro Massimo Victor Emanuele, Italy’s largest opera house. We didn’t go in, but admired its grandeur and superbly stocked gardens. You get an excellent sense of space here – not only because the building is so imposing, but the road outside is wide and not too busy, and you feel as though commerce has given way to art. It’s nice when that happens. 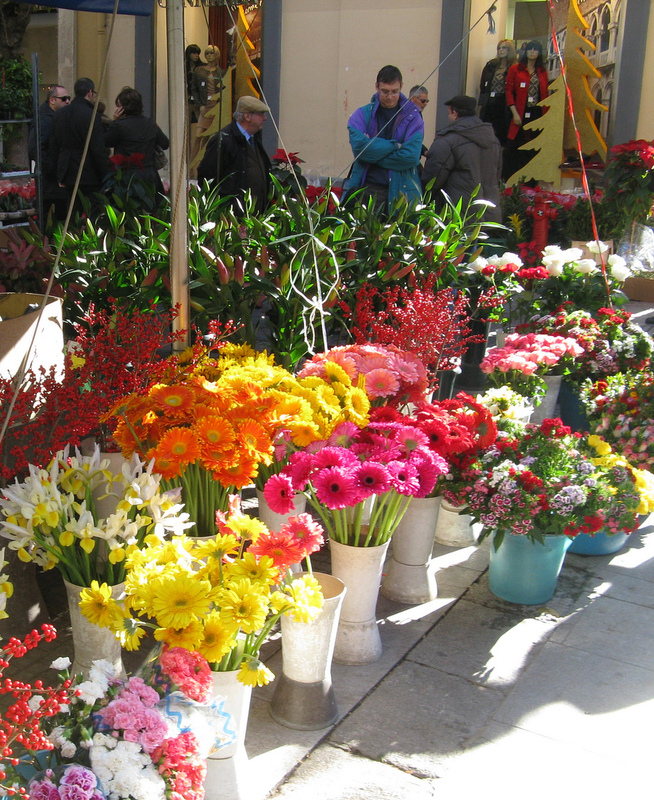 Further on, and into a market area, just off the via Maqueda, full of the usual kind of stalls full of tat, but set alongside shops that are clearly top fashion – which makes for an interesting mix. Onwards to the junction with the Corso Vittorio Emanuele, one of my favourite spots in Palermo; a simple crossroads but the buildings on all four quarters have a concave shape to give the impression of a circle. From here you can enter the Church of San Giuseppe dei Teatini, with its stunning baroque ceiling, gorgeous dome and intricate statuary. Always a nice place for a fifteen minute rest and re-grouping. From there it’s a short walk to the Vucciria district. 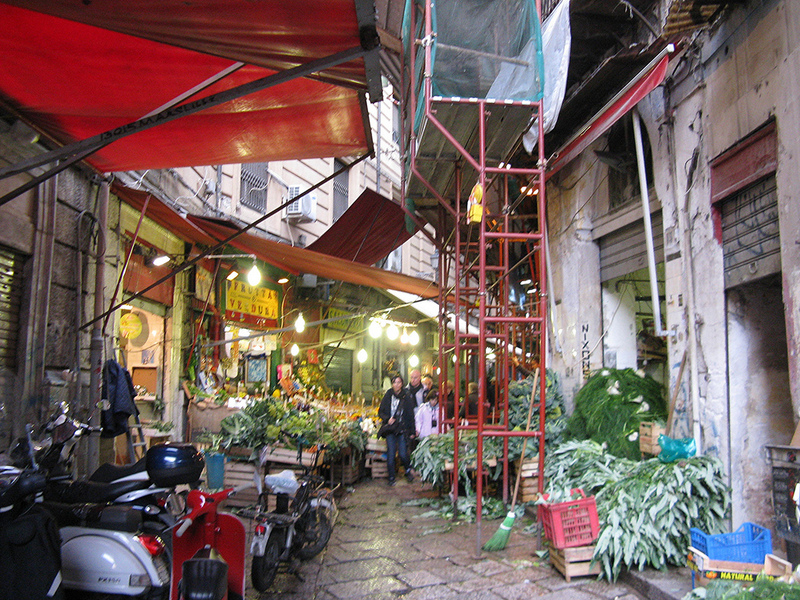 This is a none-too-pretty, hard-working, historical market area, with some narrow warrens reminiscent of the souk. 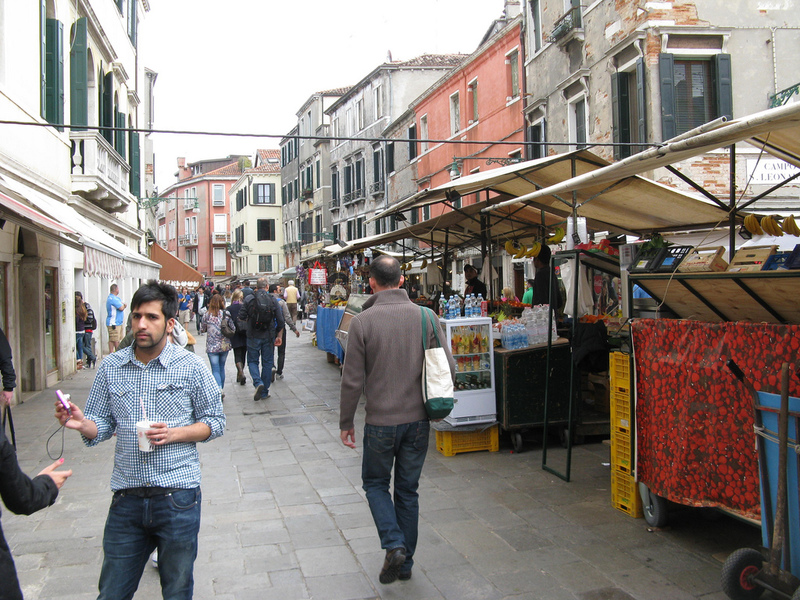 Shops overspill into the street and fight for space with pedestrians and motorbikes, awnings and scaffolding. Here you feel that you’re in the heart of the city, and that the opera houses, theatres and churches are the mere decorations on top. As you wend your way past fruiterers and fishmongers, the smells (not always pleasant) take over from the sights, and the alleyways get narrower so that the light gets blocked out. 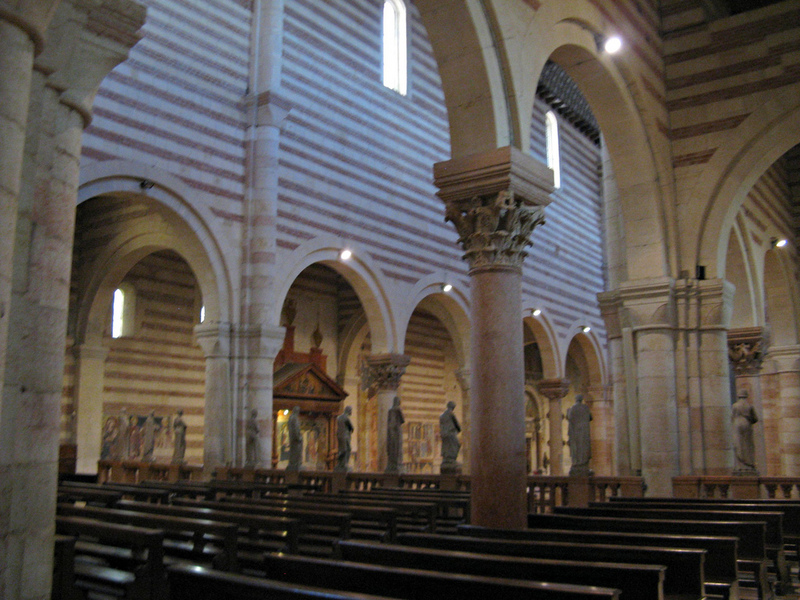 Eventually the column outside the church of San Domenico comes into view like the proverbial light at the end of the tunnel and you re-emerge into the modern day. Heading back to the port, we took a route that led us past some modern architecture, and, imposing as it was, it looked really out of place. 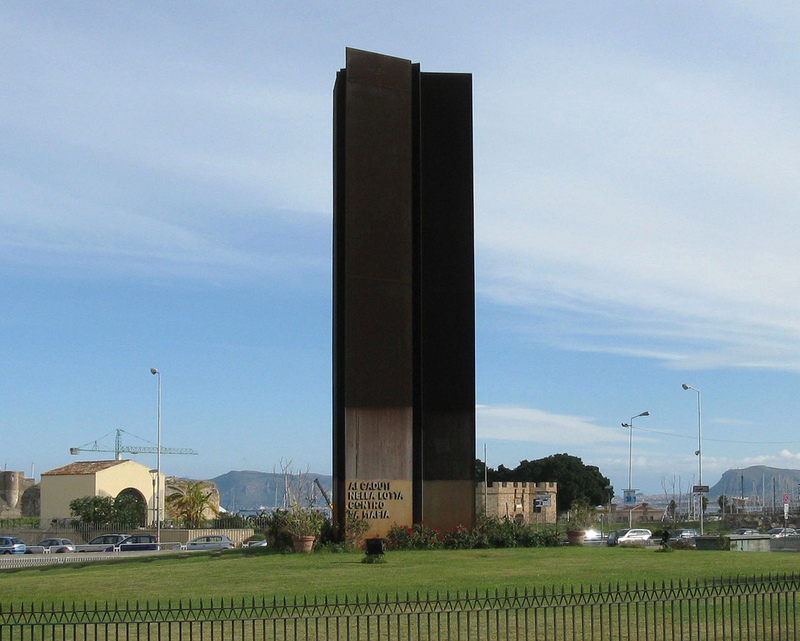 On closer inspection this tall edifice bore the inscription “”ai caduti nello lotta contra la mafia” and is a 1983 monument dedicated to those who have lost their lives in the fight against the Mafia. Quite a stark image before you leave Palermo for your onward journey. From the sun of Palermo, the next day saw the rain of Rome. Isn’t always the way? Every time we come to Rome it rains. It’s as predictable as… well, the weather really. Virtually every umbrella we own was bought somewhere between St Peter’s (where the coach from Civitavecchia drops you off) and the Piazza Navona. 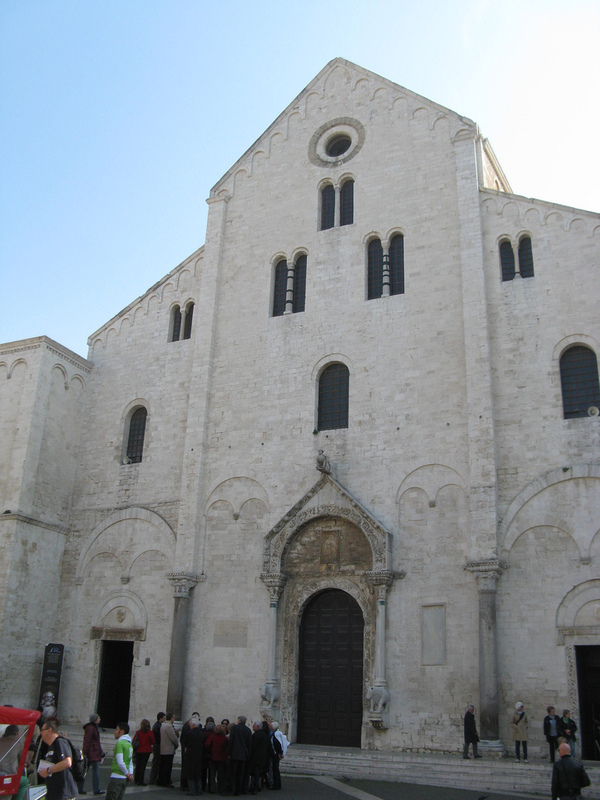 We splashed our way across the piazza and considered joining the queue to go into the Basilica – as we haven’t been in for some time – but then saw how long it was and realised it would be the only thing we would have time for. 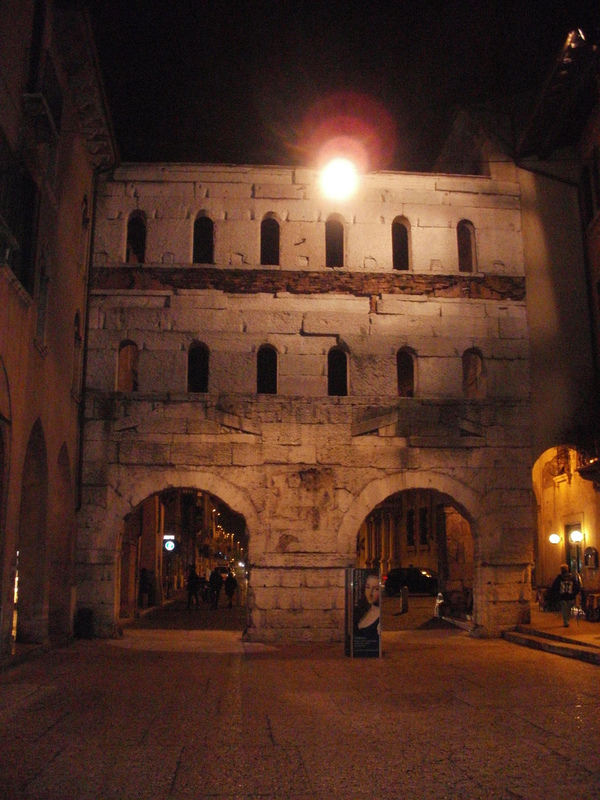 So we pushed onwards, on our usual round trip of favourite Roman sights. 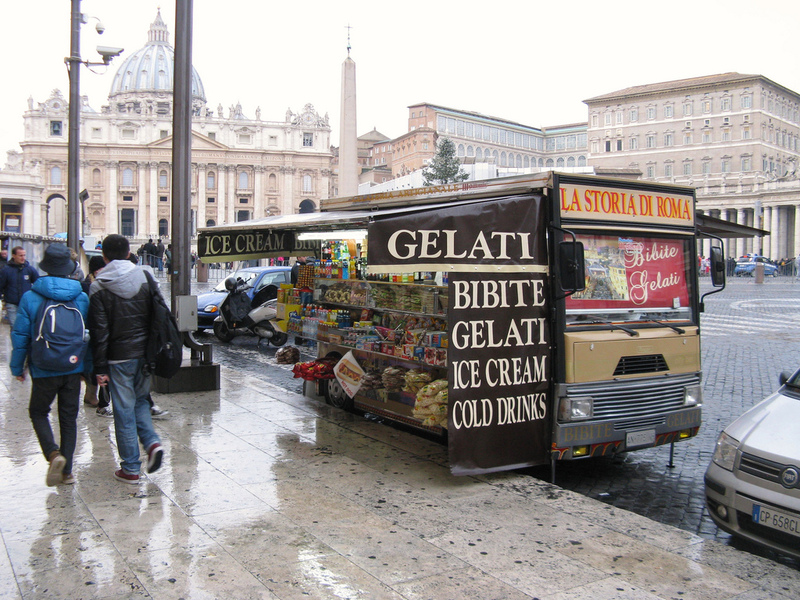 Those ubiquitous refreshment vans that you see everywhere in Rome look so drab in the rain. The promise of Bibite and Gelati looks woefully inadequate when what you really want is Bovril and broth. 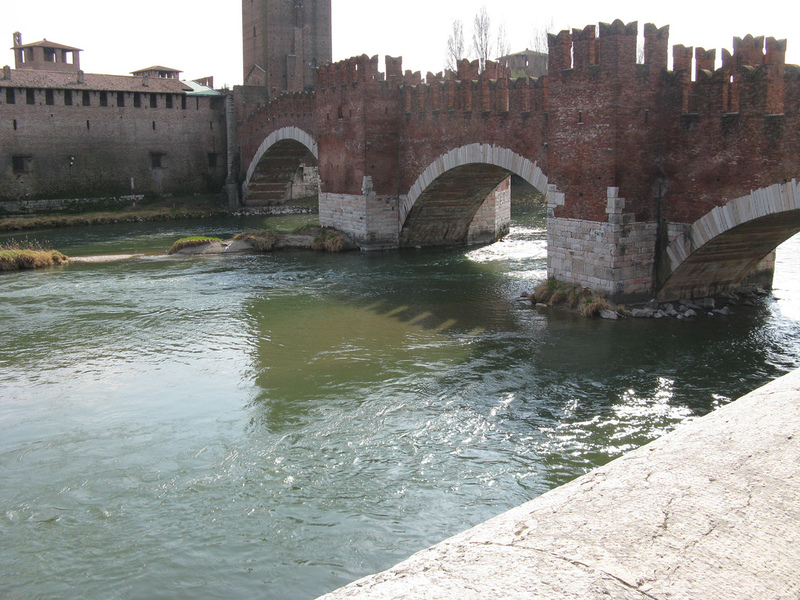 Over the Tiber we went, looking particularly gruesome in wet winter weather – the water is the same colour as a light green Morris Marina. When everyone else is wielding brollies you realise how narrow some of the pavements in Rome are, particularly when you are the only keen tourist wanting to make their way to the sights and not dawdling and taking photos of pigeons like everyone else. On the Corso Vittorio Emanuele, we nipped into the Chiesa Nuova, just in time to take a quick photo before the caretaker evicted us all for lunch. 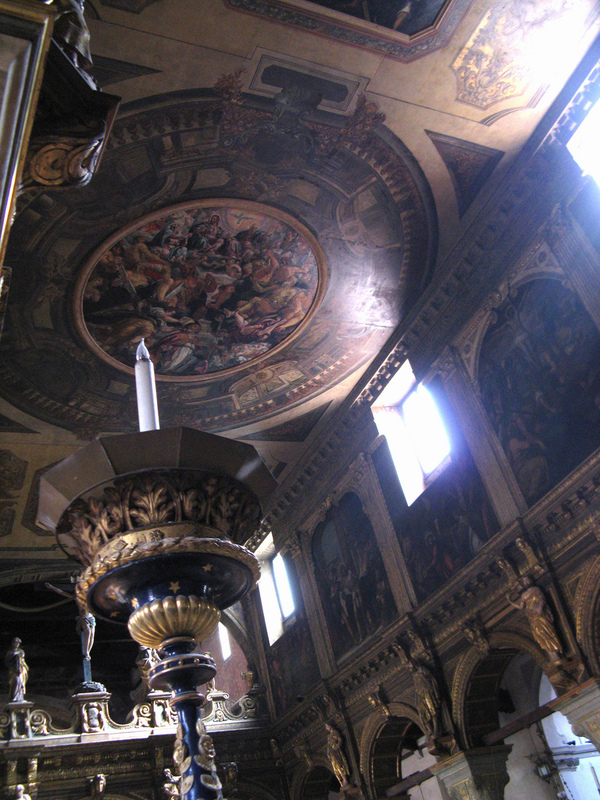 I always like to go in there to see its amazing ceiling and gold decorations – in any other city it would be revered beyond all measure, but in Rome it’s Just Another Church. We diverted off the back using the via del Corallo to take a look at the Santa Maria della Pace, and then dropped down into the top bit of the Piazza Navona. I’ve been here many times before – the first time was when I was 18 and there is a very embarrassing photo of me eating spaghetti al fresco, with it going everywhere. The prevalence of messy tomato sauce is not quite as embarrassing as the Rubettes style cap I was wearing at the time. Fashion is so cruel. 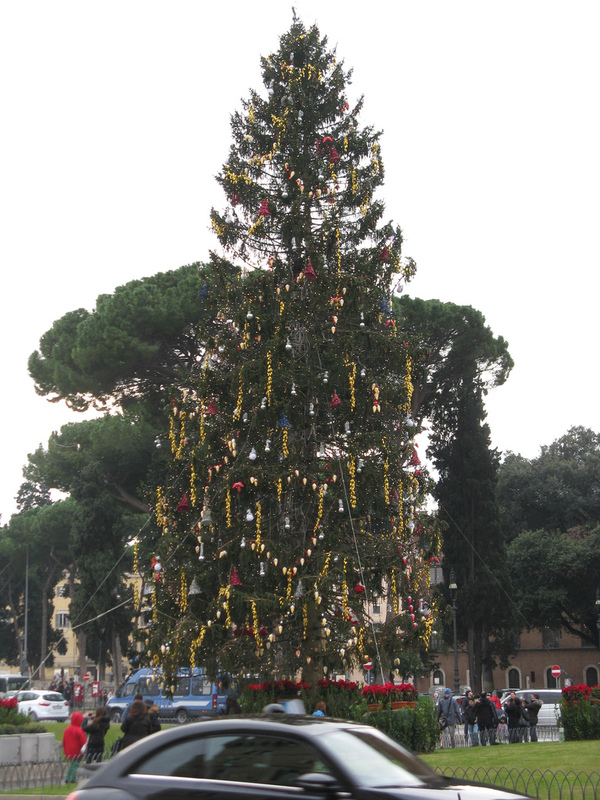 We’ve never been to Italy in December before and so I was surprised, but very delighted, to see that the Piazza Navona turns into one big Christmas market. It makes for a very lively clash of culture, with Giacomo della Porta’s fountains dominating rows of Santa hats and glass baubles. 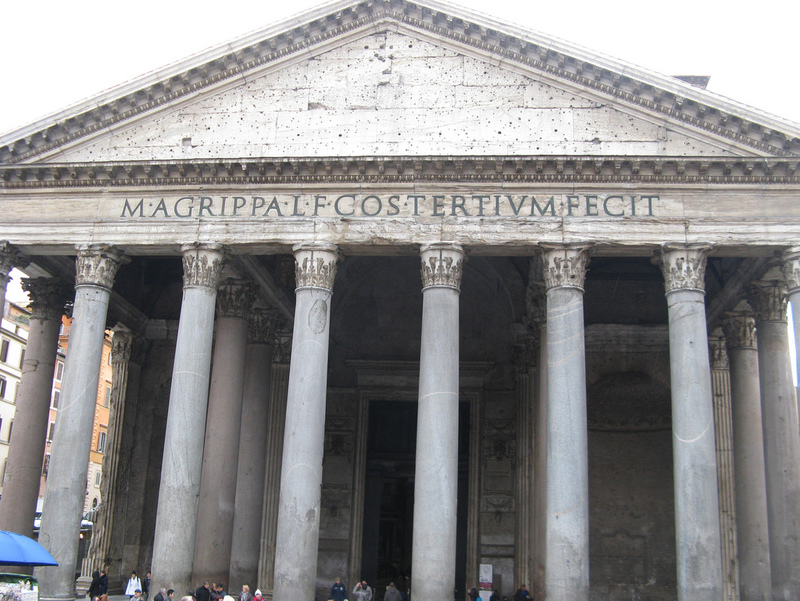 Continuing our normal route we crossed a few roads until we ended up at the Pantheon. 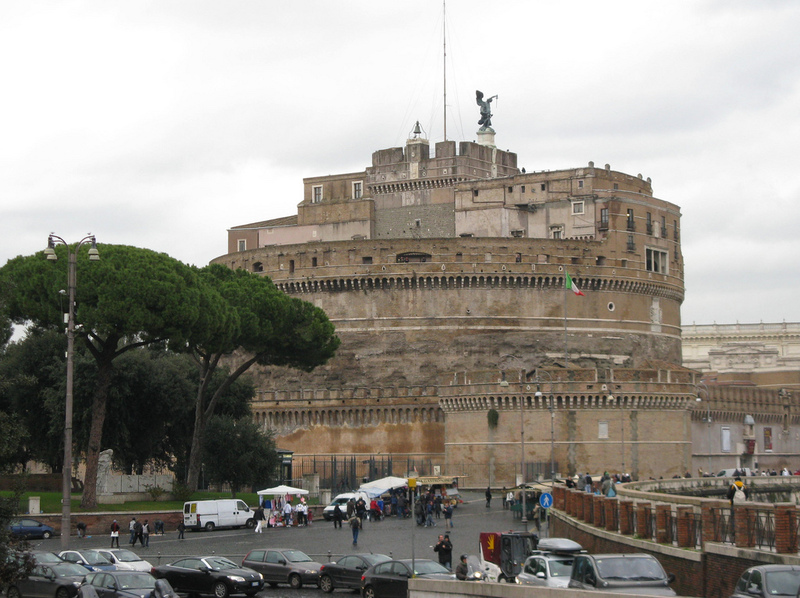 Another of our regular must-see sights when in Rome. From the outside it’s majestic; from the inside it takes your breath away. 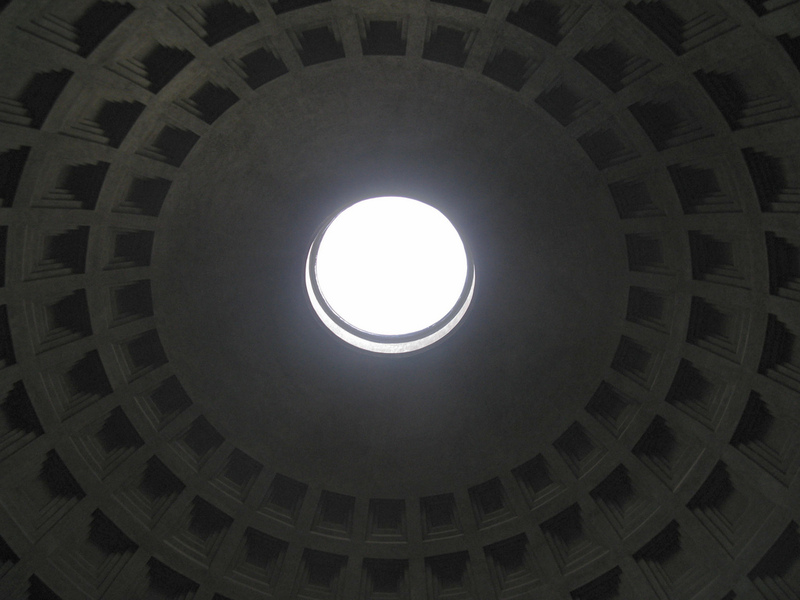 Designed by Hadrian almost 2000 years ago, the height and diameter of the rotunda are both 142 feet and the only light is provided by the oculus hole at the top. The construction was an extraordinary feat, and to think that it survives today as well as it does is beyond words. 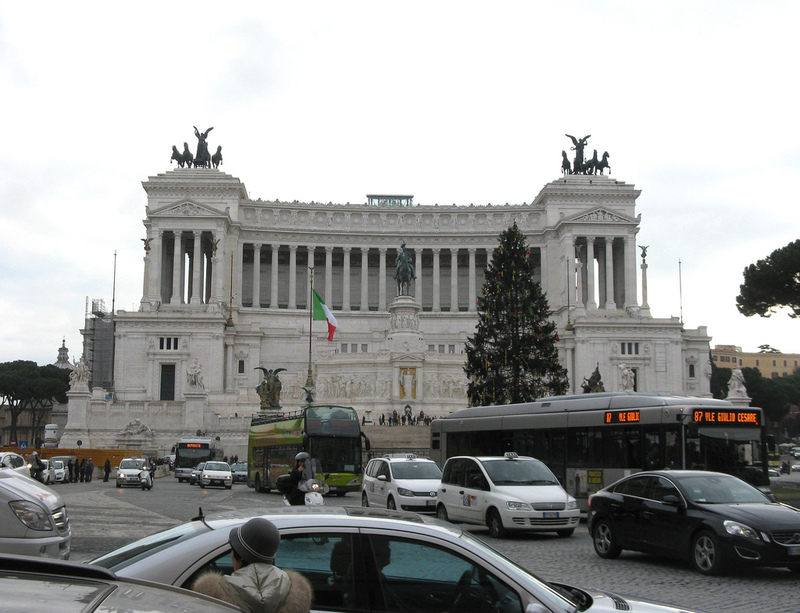 Home to the tombs of, inter alia, Victor Emanuel, Umberto I and Raphael, it’s a building that keeps pace with modern life, and I think it’s a stunner. From the Pantheon, it’s another short walk along the via di Pietra onto the via delle Muratte – a good place to buy books and calendars, and also home to an apartment where Mrs Chrisparkle and I spent a lovely week about ten years ago, so we always think of it as being “Our Residence in Rome” – and just follow the crowds to the Trevi Fountain. We could see the Trevi from our flat – and I can confirm, it never sleeps. Crowds are there morning, noon and night; and even in the darkest hour, when few tourists lurk, the city cleaners are out there maintaining it – noisily. Nicola Salvi’s dramatic horses are on a permanent mission to clamber over those splashy rocks whilst Tritons attempt to hold them back. I always find this such an exhilarating place – it’s a combination of the crowds, the noise, the water and the sculpture that I find hard to beat. You just have to gaze at it all for a quarter of an hour and lose yourself. Magic! 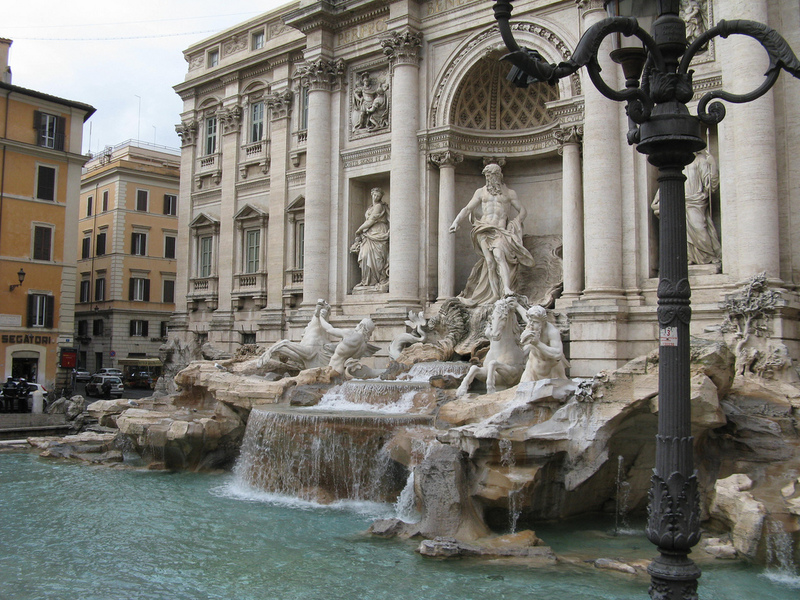 From the Trevi, you’ve basically got two choices. 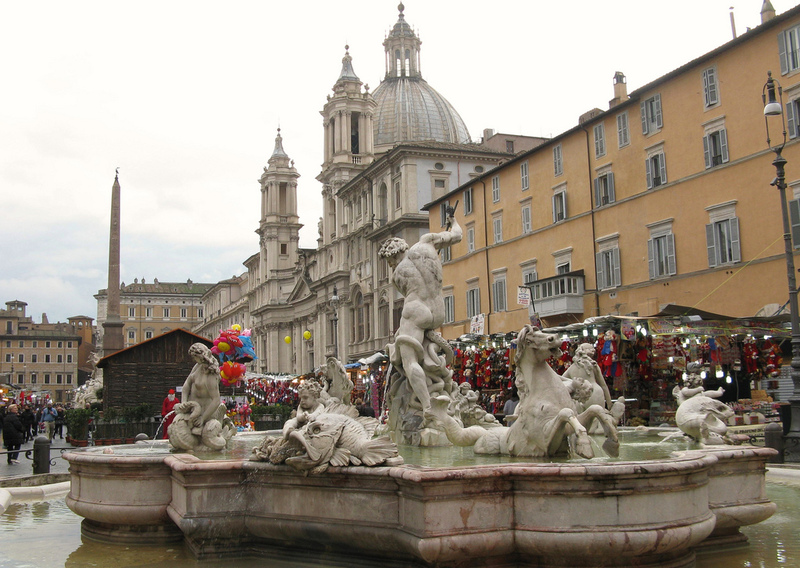 Do you head north and find the Spanish Steps? 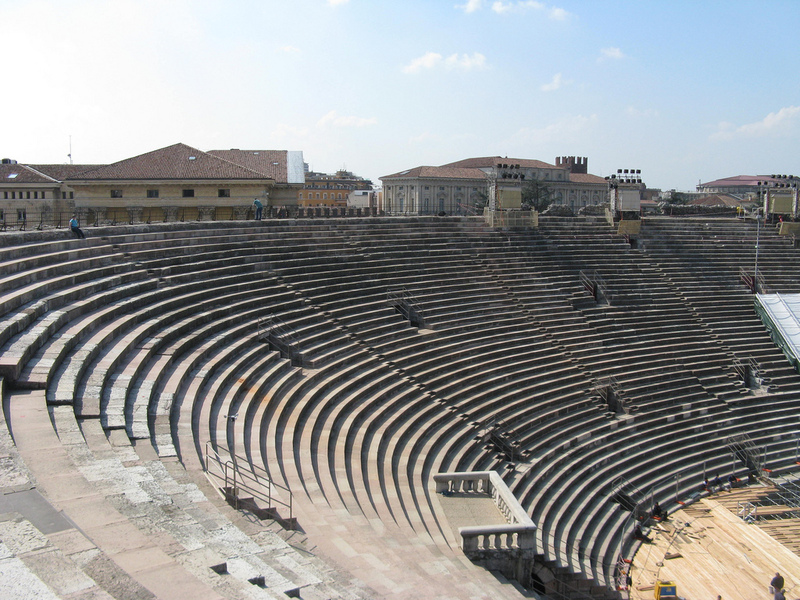 Or do you head south for the Colosseum and Forum? As we were accompanied by our nieces Secret Agent Code November and Special Agent Code Sierra, plus their male parent D and female parent M, none of whom had been to Rome before, they were desperate to see the Colosseum. That was the decider. The route takes you down the via del Corso and its fashionable shops and its fashionable shoppers, and past the Victor Emmanuel Monument, which I always like to see; that controversial structure has been likened to both a wedding cake and an old fashioned typewriter, but its main source of controversy was that it blocked out the view of the Forum from the centre of town. 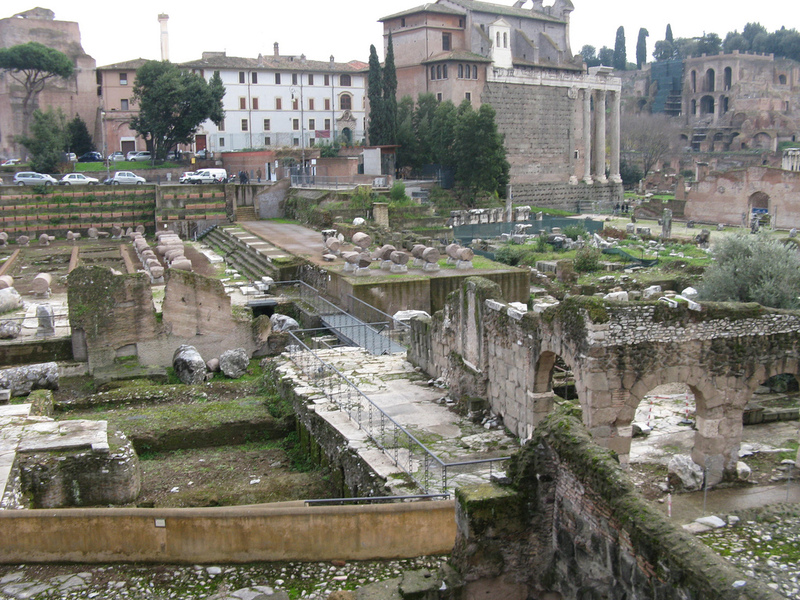 As we walked on, we looked over into the Forum area and thought it looked deserted. Odd, I thought, we’ll check it out on the way back. 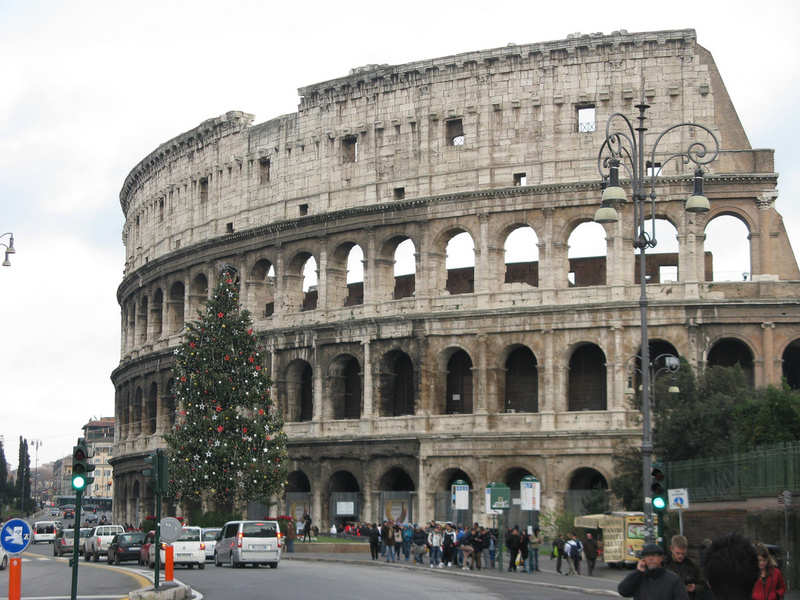 Down at the Colosseum, as it was Christmas, they had an attractive Christmas tree outside. It looked relatively appropriate in the December drizzle, but gave an additional air of bizarreness to the guys dressed as gladiators. No matter how many times you see it, the Colosseum is a wonderful sight. 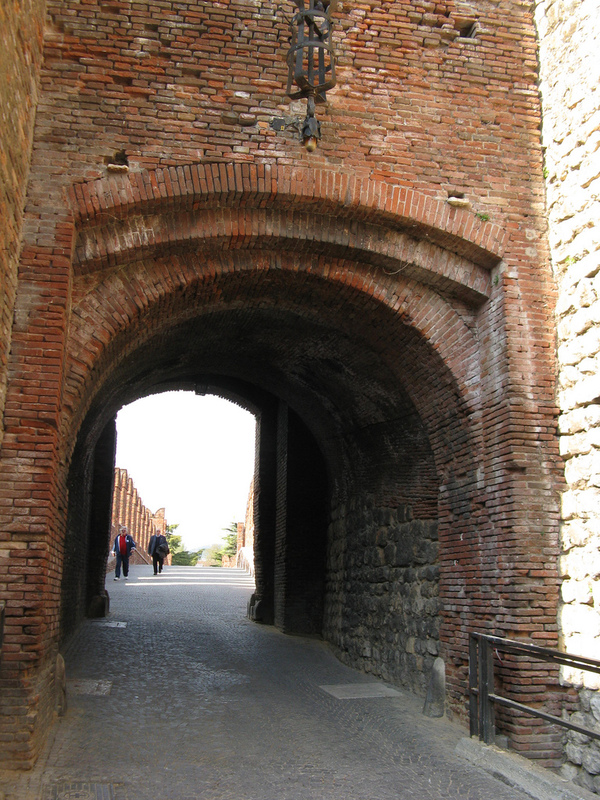 It looms so large at the end of the road, and its circular shape puts you in mind of a Roman gasometer; and then as your eyes follow it round you get the harsh reality of where its ancient beauty just stops and the wall falls away at 30 degrees from the top. It’s such a dramatic structure. The queue to get in was almost as long as that at St. Peter’s so we decided just to wander around it and drink in the atmosphere. 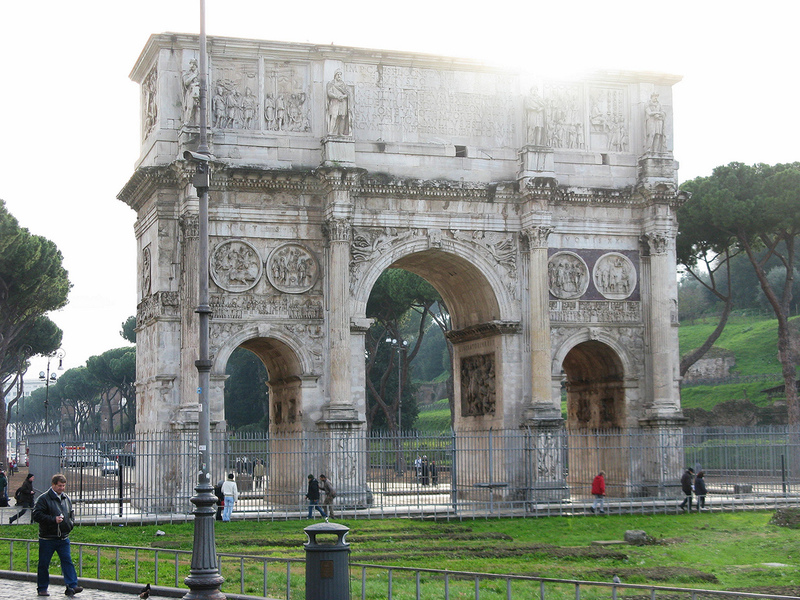 Nearby is the stunning Arch of Constantine, which looks like (and of course is) an ancient monument but it’s actually 200 years younger than the Pantheon. 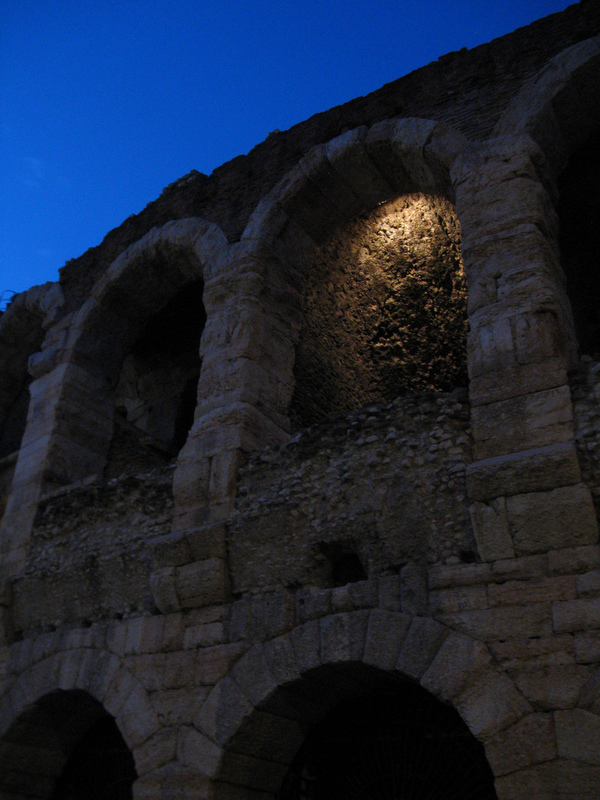 We thought we’d return back through the Forum, which is when I discovered why it was empty. They were charging to get in! I’ve never been charged to get in before. I think they now only have one free day a week or so. It’s a real shame, because, like nipping into a gallery for fifteen minutes to do one room really well, it was always nice to dip in for a short while and be at one with history. Now you have to plan your visit and give yourself enough time to do the whole thing, or else it isn’t worth the entrance fee. And we didn’t have enough time to do the whole thing. So we didn’t go in at all. Just going to give a mention to our other favourite Rome sight, even though it’s one that we didn’t fit in on that day, and that’s the church of San Clemente, at the via di San Giovanni in Laterano. What’s incredible about it is that it consists of three churches in one, each built on top of each other, over centuries of use. In the basement is a pagan church from the 4th century; at street level there is a 12th century church and on top is a 17th century extension dedicated to St Clement. 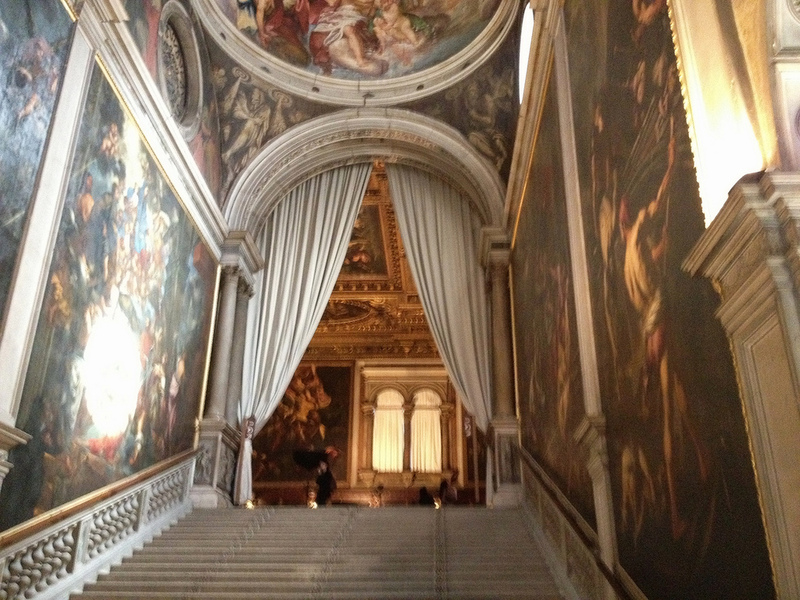 You feel as though, just by travelling a few feet, and going up a few stairs, you pass through eras. A memorable sight. And that concluded our two days in Italy. 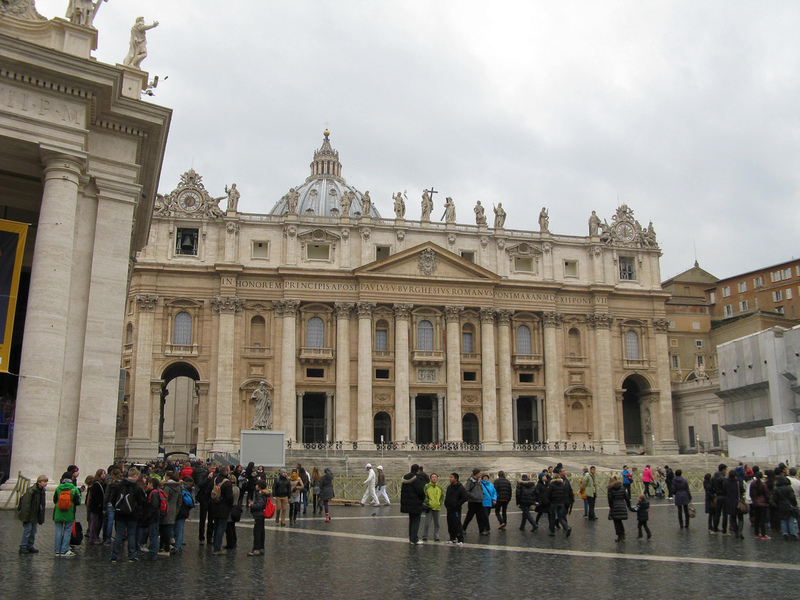 We returned to St Peter’s using the subway system, and it worked like a dream. A slow coach ride back to Civitavecchia, but by taking the “official” unescorted tour, you know the ship will wait for you if you are delayed. There’s nothing quite like a cheeky Mediterranean cruise to excite the sightseeing buds and the MSC Splendida is a very beautiful ship indeed. Hopefully we’ll be back soon! After our week or so leisurely exploring the delights of northern Italy, we boarded our ship the MSC Magnifica and started our seven day cruise. 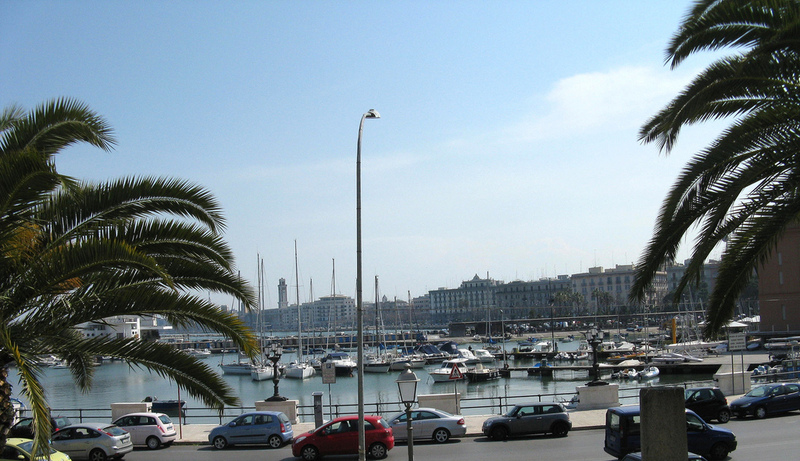 The first port of call was to be Bari, in the Puglia district of southern Italy. I’d always thought that ships stopped here simply to refuel but that would be most unfair to this charming city, albeit in a workaday fashion. From what I’ve seen, very little of Italy is what you could term “pretty” – but its natural colour, warmth and architectural styles make it a very pleasing destination. And so it is with Bari. The ship docks centrally so just a fifteen minute walk takes you to the centre of the old town. 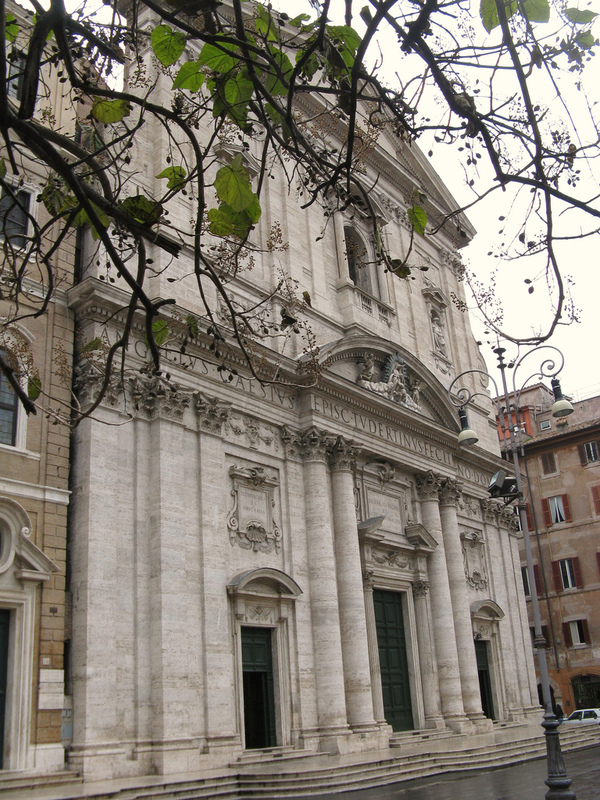 There aren’t that many actual “sights” as such, but a good place to start is at the Basilica di San Nicola. We arrived at about 11.00 on a Sunday morning and the church service was in full swing, as you would imagine, so we didn’t linger inside making a nuisance of ourselves. 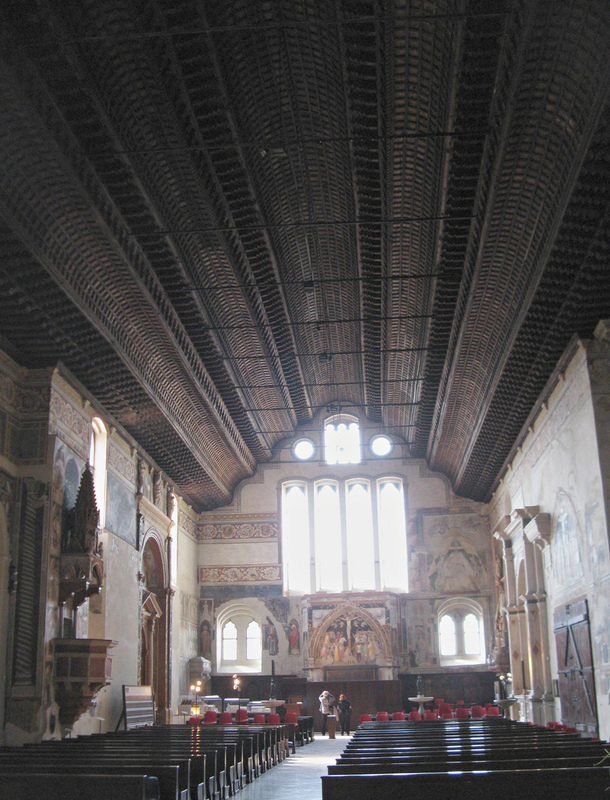 Nevertheless I could establish it has a beautiful ornate ceiling and it’s one of those churches that is light and bright inside rather than dark and austere. 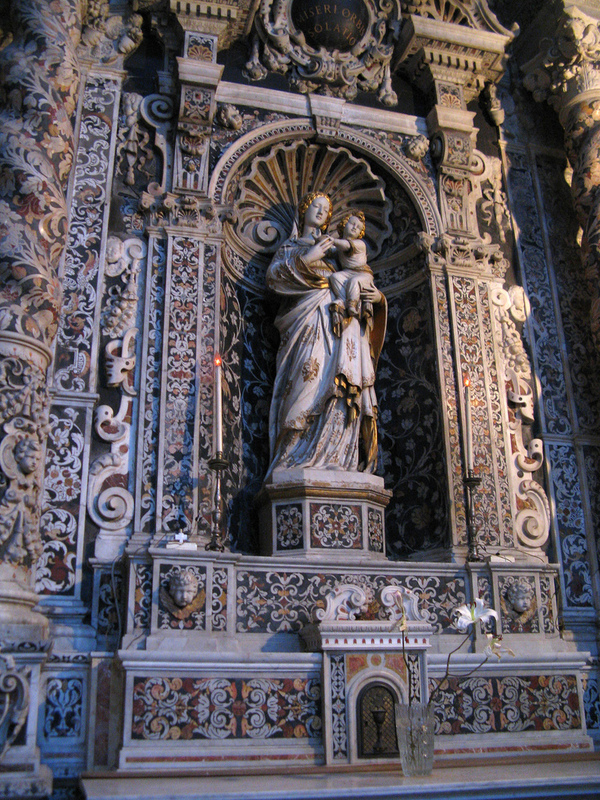 It dominates a small square, in one corner of which is a rather impressive statue of San Nicola himself. 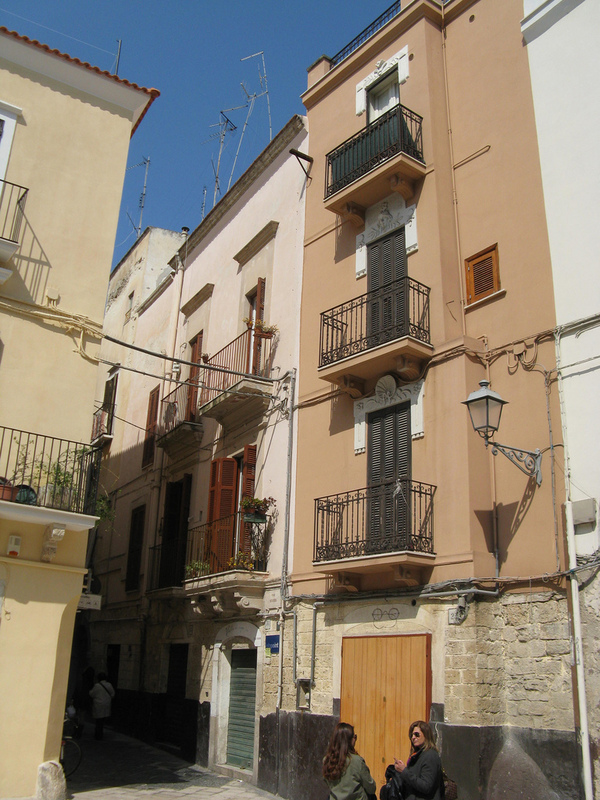 Off the square are narrow streets with just enough room to accommodate you, the locals, the motorbikes, and the tradespeople who are all jostling for supremacy. We had arranged to meet Mrs Chrisparkle’s uncle Professor Plum and his wife the Lady Plum, as they were touring southern Italy at the same time, as chance would have it. We found a nice little café in the early spring sunshine just off the San Nicola piazza and sat outside and drank coffee whilst we reminisced about old times. From there we followed the narrow streets to the Cathedral, with its impressive tower and dome, and inside it’s full of interesting statues, carvings and artwork. We had a long linger here. We wandered round to the castle, which is grand and imposing from the outside but when you enter it you realise they charge you to see plaster casts of sculpture and you think, actually, I can spend my time and money better elsewhere. So we moved on and simply followed our noses in a circular direction that took us back to the centre of town. Avon were sponsoring a road running race so the town was busy with spectators. We didn’t see many runners though – I think they’d already finished and set about having lunch, which is precisely what we decided to do. 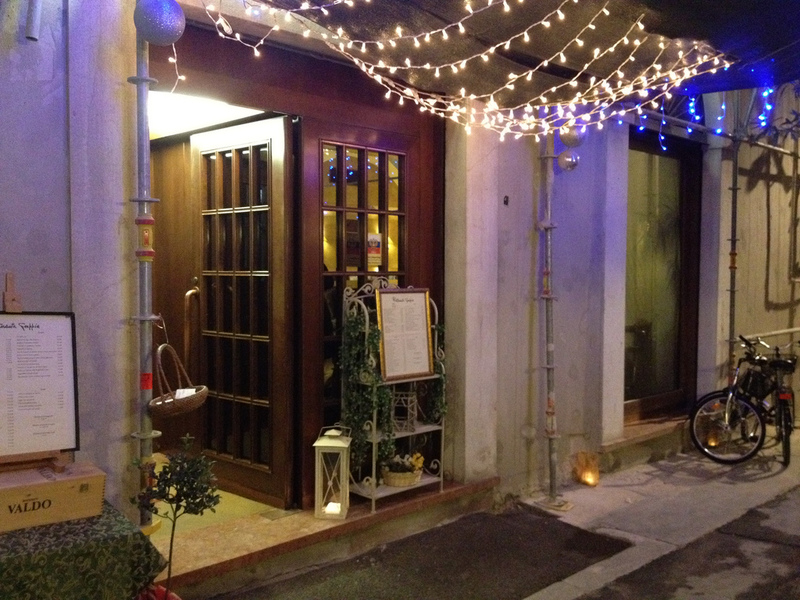 We found a lovely little place to sit outside in a square, the Trattoria Mercantile, where we had pizza and a bottle of Greco di Tufo at an extremely reasonable price. The time flew by but we had the opportunity afterwards briefly to walk around the coastal road admiring the views before we’d completed a full circle and were back at the ship. We bade farewell to Professor and Lady Plum who continued their Puglian Odyssey, and we got back on board the Magnifica for the onward sailing to Olympia. Of course it’s not Olympia where you dock, it’s Katakolon, but what else are you going to do when you get off your ship in a village artificially extended purely for the purpose of taking hordes of cruising tourists the short drive to Olympia. I hadn’t done my pre-travel preparation properly – not like me at all – and I was convinced we were going to Mount Olympus. Wrong – it was Olympia, the birthplace of the Olympic Games. I would say it is vital to go with a good guide or a good guidebook at least, because if you just wander round by yourself it’s very hard to get a clue as to precisely what you are looking at. It’s an impressive sight overall, although with poor facilities – Mrs C and Lady D would not recommend the Ladies’ toilets. The little town alongside Olympia has a few shops – not bad quality at all – and some bars and restaurants that advertise free wifi, that sadly seem to be only accessible by one person at a time, hence a lot of frustrated people flipping shut netbooks and shaking smartphones. 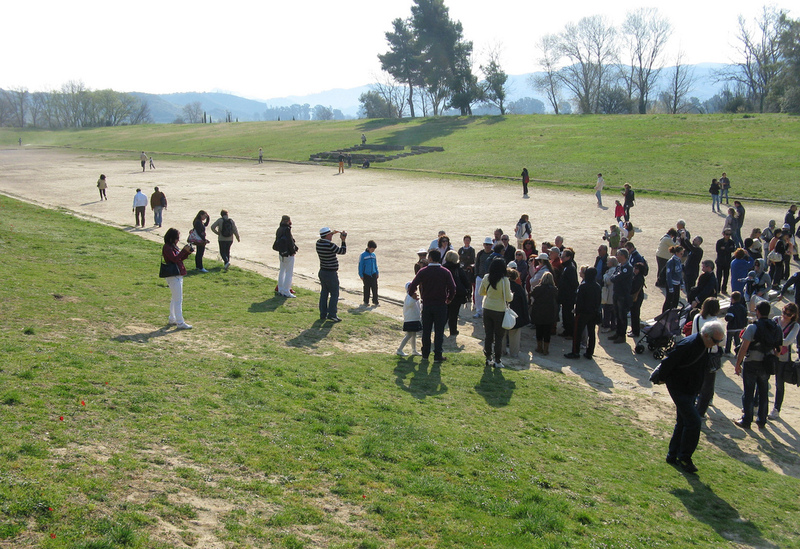 But that’s not the reason you come to Olympia – you come for the history of the birthplace of the games, to stand or run on the running track yourself, to imagine yourself taking the Victor Ludorum and becoming the Local Hero. The track is very interesting, as it’s still completely visible and clear – and is a long “straight line” track, as opposed to the circular tracks we expect to see today. The archway entrance is still in good condition, although a lot of the rest of the site comes across as varying degrees of rubble, which is why you need a guide to make sense of it. The loud and cheeky lady taking us round brought it to life and it was very informative. From Katakolon it’s a short hop – maritimely speaking – to reach Izmir in Turkey, from whence one of your tourist options is to take an excursion to Ephesus. 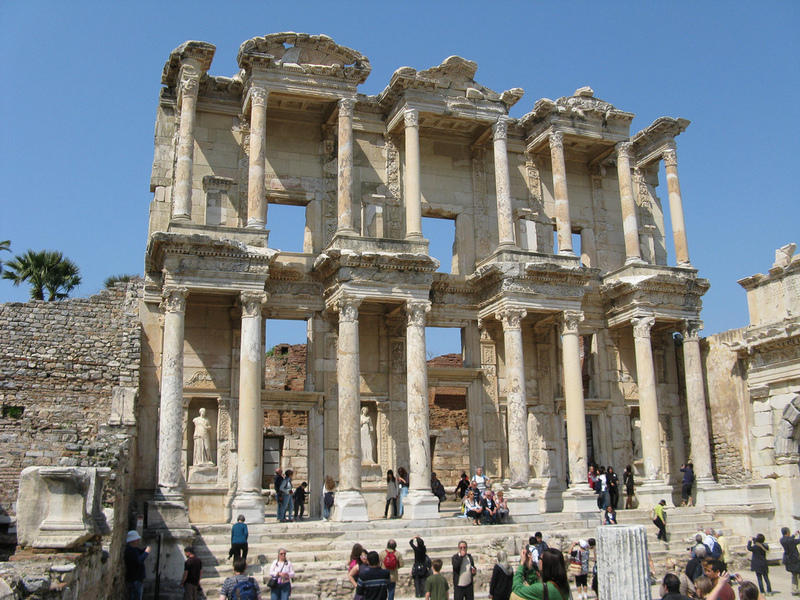 I’d wanted to go to Ephesus ever since I first saw “Comedy of Errors”, so that I could imagine Antipholus and Dromio in situ, and, wandering around the place, you really get a feeling of how rich and privileged a place it must have been to live. 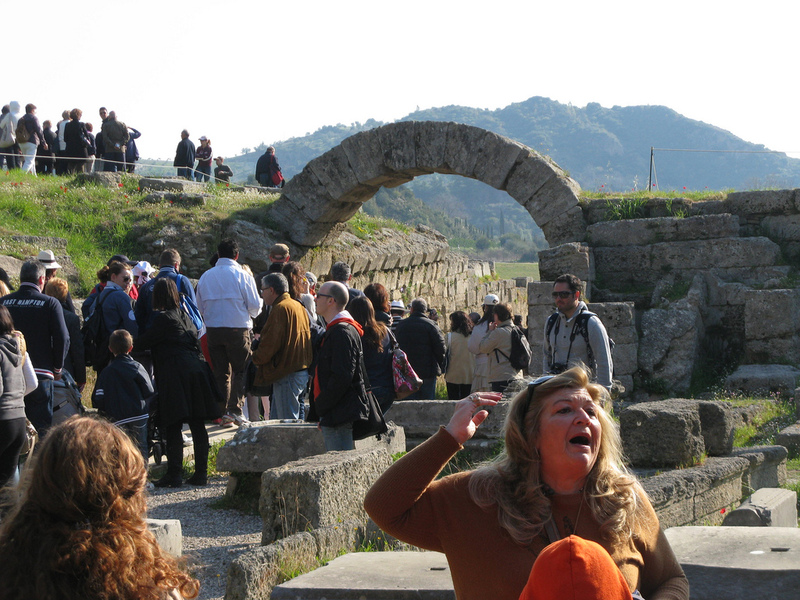 But before you reach Ephesus, first you visit Mary’s House. 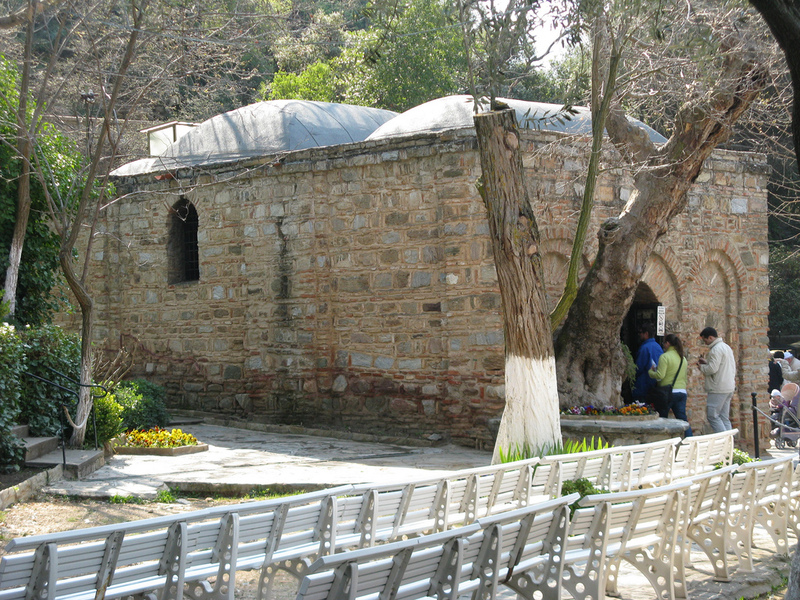 Yes, this is indeed the Virgin Mary’s house, apparently; for many years it had generally been believed that Mary spent her last years in the Ephesus area, and about 200 years ago a nun had a vision of precisely where her house was, and how it was constructed. Clerics and dignatories identified this building as the one in the nun’s dream; ergo, it’s her house. Of course, it is a holy place, and treated with a lot of reverence. 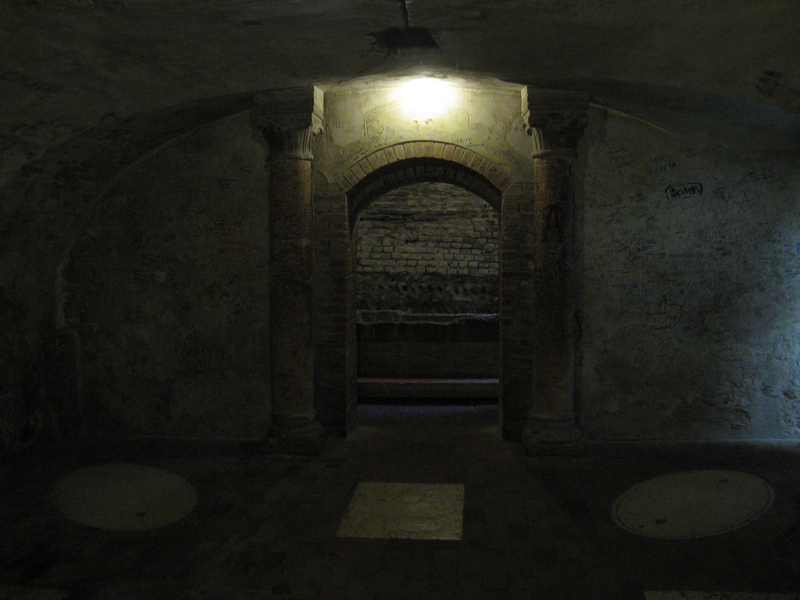 If you go, you will join a queue of people shuffling to get in; you will smile benignly at the nun on duty who will scowl back at you; you will go through the living room and bedroom, both of which look just like chapels, and then you leave. You don’t really get a chance to linger and look around, which is a shame, but to be fair you do get something of a frisson that this just might be where Mary ended her days. Outside there is a spring where the devout go to bottle some water and drink it or take it home as a blessing. Apparently you should make a wish when you drink the water. Lady D wouldn’t tell us what she wished for, but she’s started doing the lottery again. 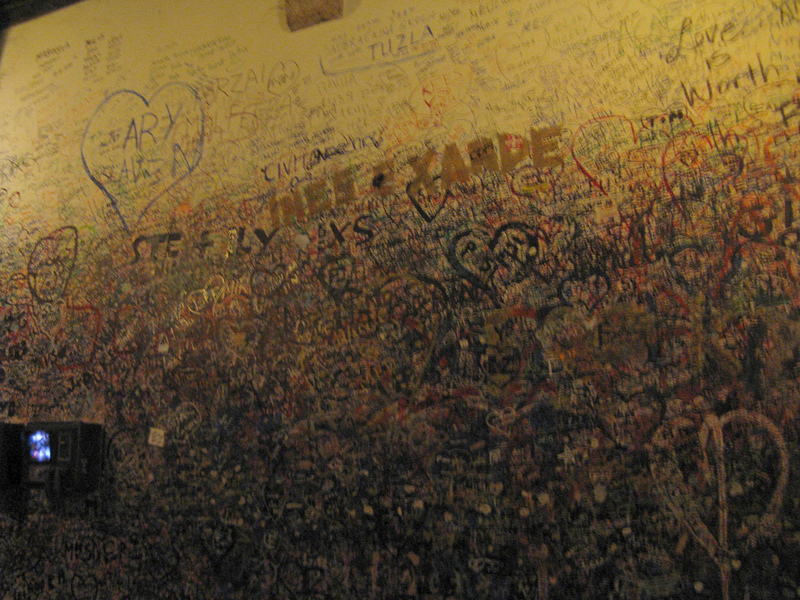 The long walls alongside the well are completely covered with prayers for the Virgin Mary – little pieces of paper which make an impressive sight. There’s also a humdinger of a wide well outside the house; you wouldn’t want to be stumbling back late after a night at the tavern, guessing the route home in the dark. 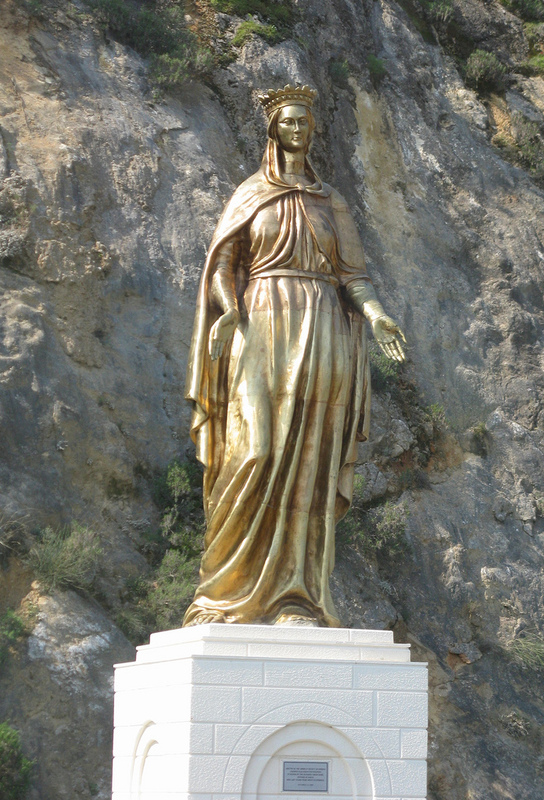 Between Mary’s House and Ephesus there is a splendid golden statue of Mary alongside the road. It’s really rather beautiful. And so on to Ephesus. We’ve been to Palmyra in Syria; and unfortunately once you’ve been there nearly all other sites of ruins look like just a bunch of ruins. But Ephesus is special; it covers a considerable area and has a comparatively large number of extant buildings so you really get a good impression of the town as it was. Unlike Olympia, many of the major buildings and sights are well described on information boards, including in English, so you can easily just wander round by yourself, learn a lot and drink in the atmosphere. There are at least two amphitheatres, as far as I recall, and a number of houses, temples and so on. But the big pleasure of Ephesus is the main street, with buildings and mosaics either side, going down a hill towards the Library on the left hand side. The Library is great – it puts you a little in mind of the Treasury in Petra, although Petra is in much better condition. 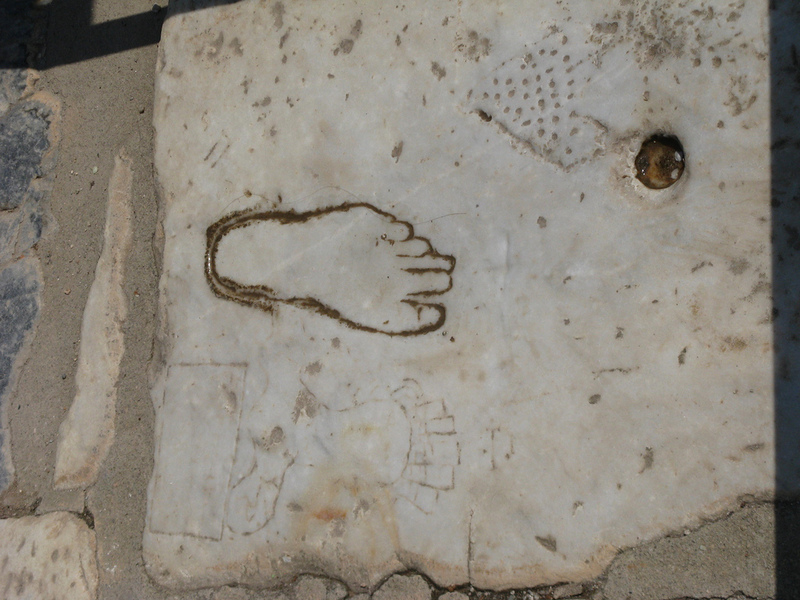 As usual in these places, there are a lot of entertaining things to see – like the directional footprint on a marble slab pointing the way to the House of Ill Repute, and the rather splendid communal latrine. On the way out there are a number of sarcophaguses just lying around in the grass and the carvings on them make it well worth the detour. So I would say a day trip to Ephesus is a must, even if, as on this cruise, by coming directly after a day at Olympia, it means negotiating non-stop rubble for two days. I have two self-contradictory comments to make about Venice. On your first visit there, it looks precisely as you had always expected it to look. The basic vistas have not changed since Canaletto set up his easel, and you are staggered how accurately he captured the place, all those years ago. So in a sense you already feel slightly acquainted with it. But – and here’s the contradiction – nothing can prepare you for the majestic awe you experience when you emerge from Santa Lucia Station. You look around you and all you can see is Venice. 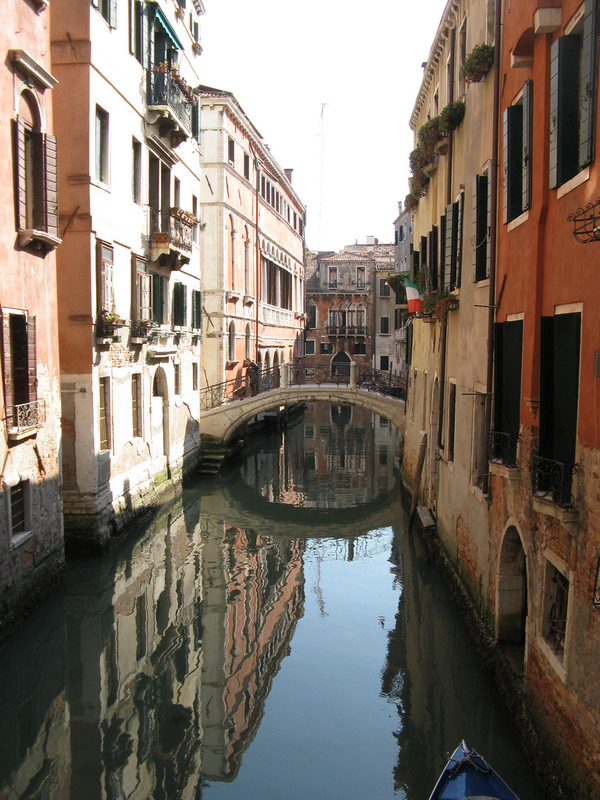 Venice everywhere; it takes your breath away. 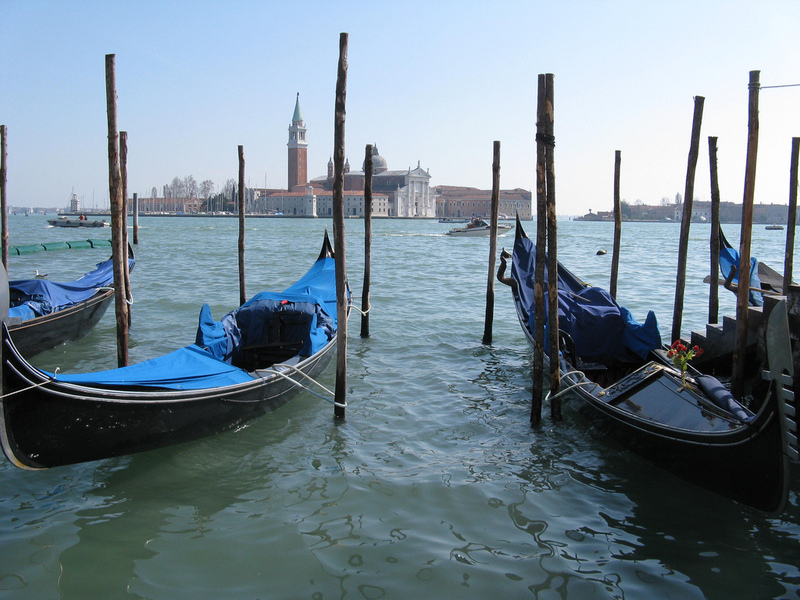 Gondolas, water taxis, vaporettos, bridges, people, pigeons, canals, wooden poles stuck in the water, blue and white stripey shirts, pastel coloured buildings, all of it constituting huge dollops of Venice. 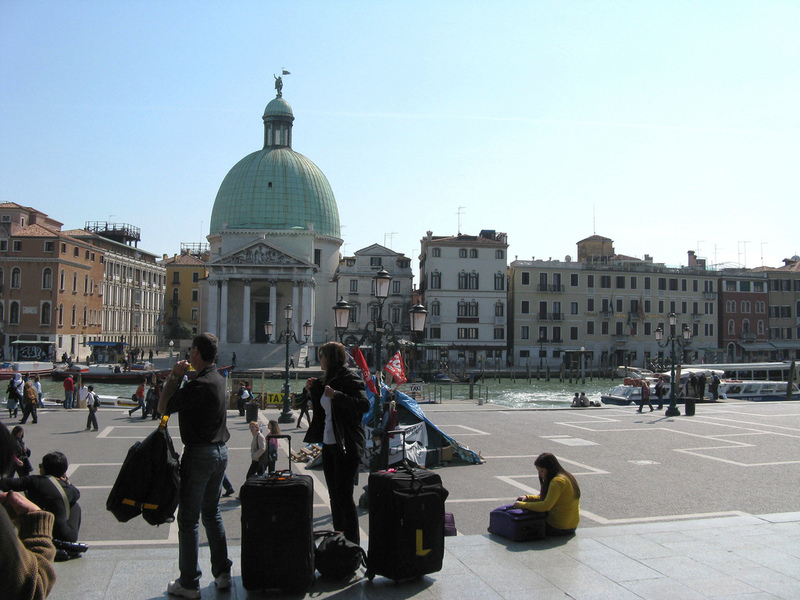 Not only laden down with suitcases but also with a packed lunch we bought at Padua station – as we assumed all the eateries in Venice would be ridiculously expensive – we slowly wended our way down one of the world’s longest train platforms – or so it felt. We had arranged with our hotel that we would be met at the station by a water taxi and “hostess” to take us to our hotel. The hostess was a loud in-your-face tourist guide who took the mickey out of my surname and faffed around for ages trying to find us a water taxi. But when we did eventually get going it was a marvellous 25 minutes journey, delving deep into the canal system; and by the time we got to our hotel we felt like we’d had a really privileged excursion. 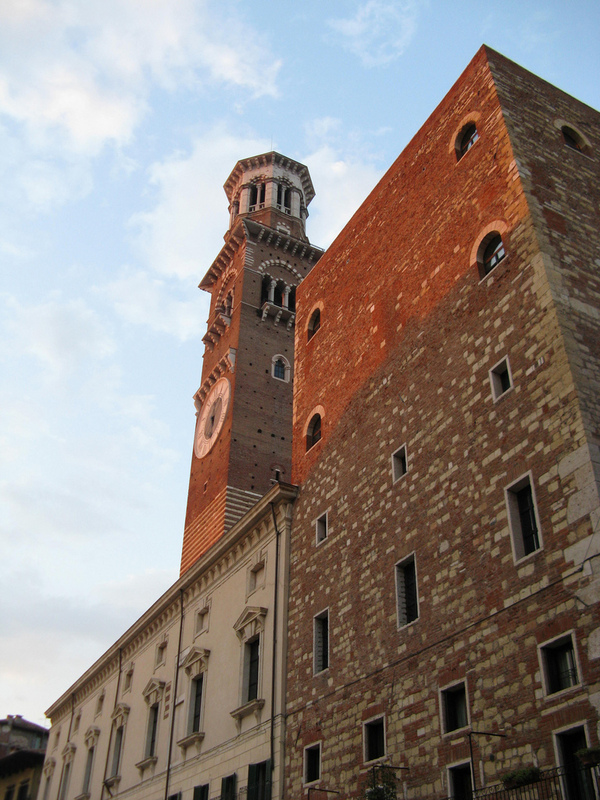 As many do, our hotel – the Duodo Palace – has a land and a water entrance, and walking straight into reception direct from the boat is a very swanky feeling. 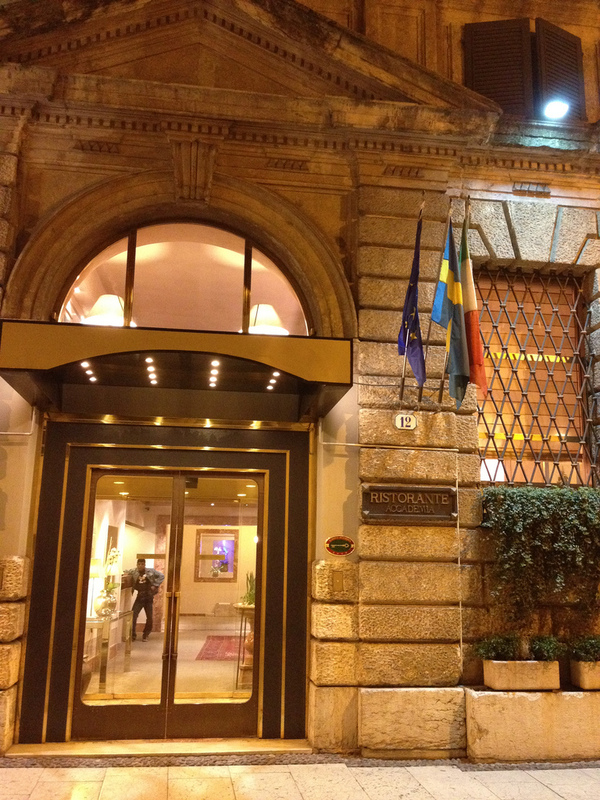 Top marks to the Duodo Palace for a terrific welcome. 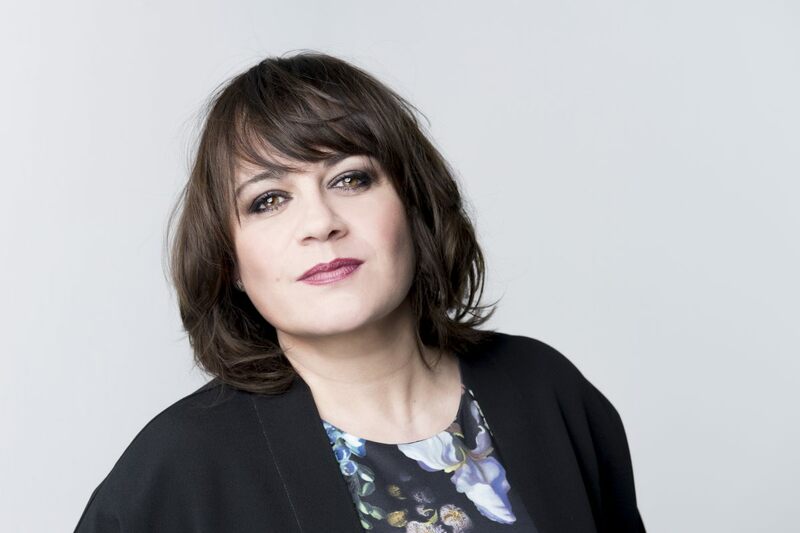 If felt as if the concierge and I had known each other for years – extremely friendly and helpful but also extremely polite; a perfect blend. 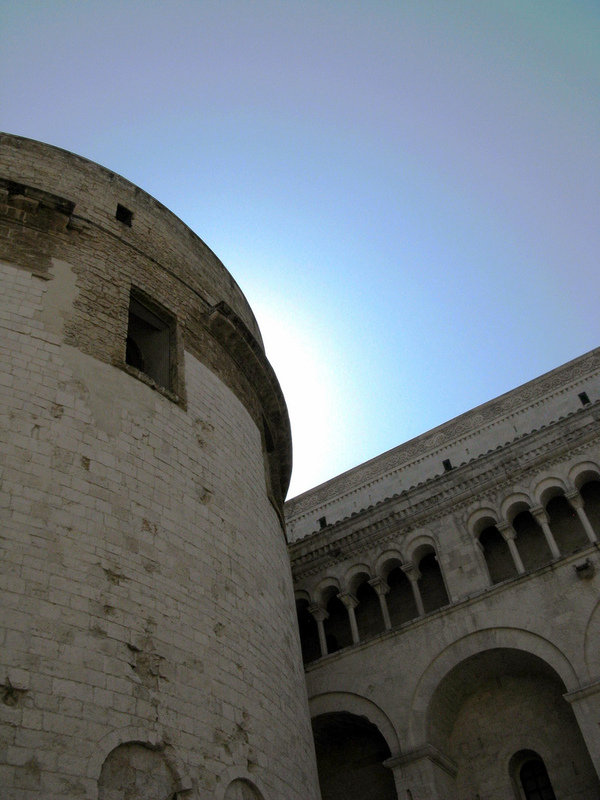 The Duodo Palace is a converted palace, you won’t be surprised to hear. As a result it is very elegant and attractive, quaint and irregular. Our third floor room was comfortable but a little squashed. The bathroom was quite big though and everything worked. Lady Duncansby’s room was on the floor below, and in all the time we were there we never worked out how you went from the third floor to the second floor by foot. If you walked down the stairway from the third floor you emerged at the first. It’s almost as though you can only get to the second floor from Platform 9¾. Fortunately there was a lift so we didn’t spend too much time worrying about it. Before we left for a mosey into town, our new friends at the Conciergerie suggested another water taxi tour later on in the afternoon. They described it as an hour of pure relaxing pleasure. Would 5.30pm be suitable? It sure would. At 130 euros for an hour, to include a bottle of Prosecco, it wasn’t cheap entertainment but we were well in the mood. Time to go out now; being just a relative stone’s throw from St Marks’ Square, we headed in that direction. Of course, every street in this neck of the woods is lined with gift shops, so progress is slow, as Mrs C and Lady D inspected every item of jewellery, handbag and dress en route. Fortunately they’re not into carnival outfits. St. Mark’s Square is thronging and fabulous. Very posh and expensive cafes line its sides, with string quartets and similar musical entertainment pushing up both the style and the costs. We took our little picnics down to the water’s edge, sat on some steps opposite San Giorgio Maggiore, consumed now rather warm and soggy sandwiches and it was bliss. You are completely surrounded by thousands of people yet there is an enormous feeling of peace and relaxation. It is simply an extraordinary place. There was no queue to visit the Doges’ Palace so we thought we’d give it a try. It’s a grand old place and very attractive, particularly the marvellous Sala del Maggior Consiglio with Tintoretto’s magnificent Paradise covering an entire wall. When you see it, the scale of it is breathtaking. But the whole palace is architecturally very stirring. You also get to see all the prisons and walk across the Bridge of Sighs, which I always – erroneously – thought was so-named because it was so beautiful. Wrong! The sighs are because you’re just about to be chucked in the clink. We popped briefly into St Marks Basilica but it was a bit too busy to appreciate. You quite quickly get satiated with artistry and opulence, so we admired the outsides of the buildings and promised to return later. 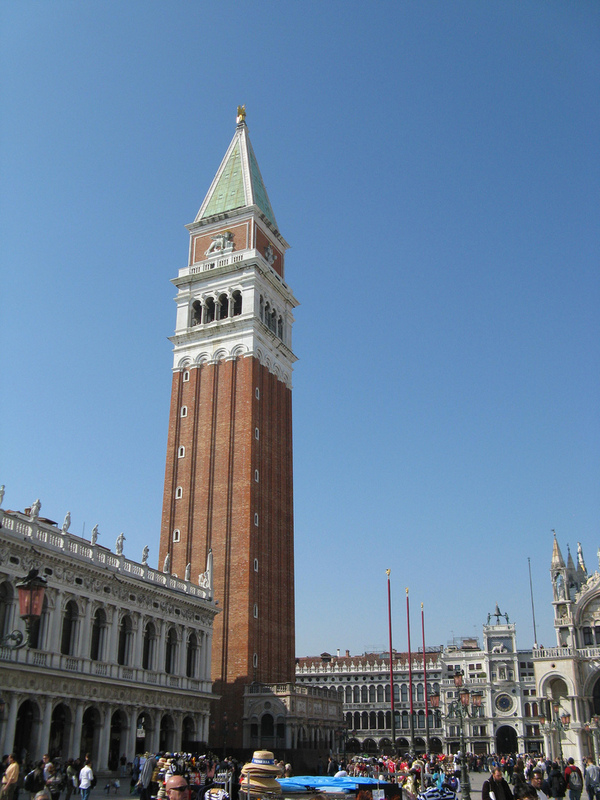 Other stunning sights in the square include the Campanile and the beautiful astronomical clock. I quite fancied visiting the Clock Tower but simply couldn’t locate the entrance. Another reason to return another time. So we hot-footed it back to the Duodo Palace for our 5.30pm appointment with the man with the water-taxi, and a gift of a bottle of Prosecco from Signor Concierge and we sat back and let Venice engulf us. Actually, we didn’t sit at all – it was all far too exciting. We all stood at the back of the boat, bottle or glass in hand, cameras and phones ready to capture anything that passed us by and we had a whale of a time. 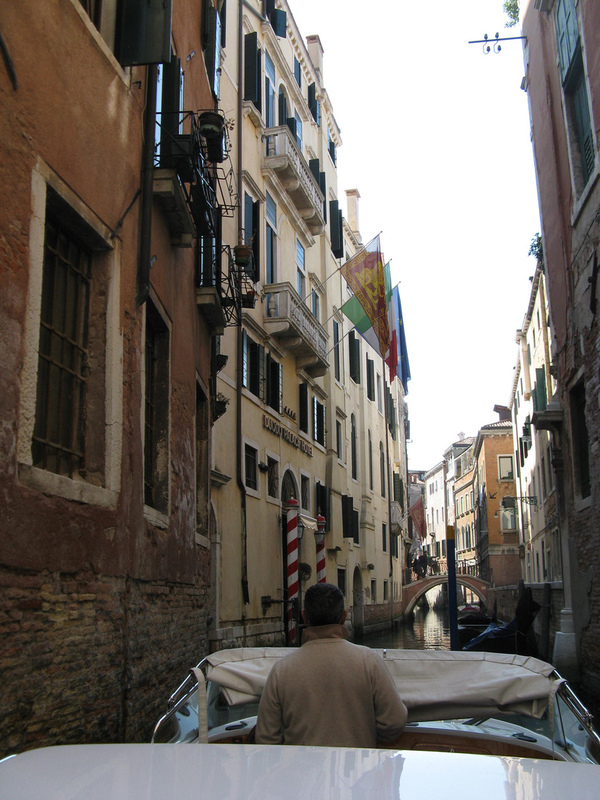 Our route took us up the Grand Canal right to the sea’s edge, round the outside a bit and then back into the city plunging through small waterways that you would otherwise only see on the map. We must have taken hundreds of photos; just a magical, privileged afternoon, and the only way to see Venice in style. 130 euros don’t go that far in Venice, but it really was one of those “you only live once” moments. After the statutory afternoon nap, we headed out for dinner. I had done some research and it seemed to me the only way to get a decent meal in Venice was to pay through the nose for it; and even then, it’s no guarantee. The place is so full of tourists staying for just a short time, that restaurateurs never expect to see you again, and accordingly don’t bother to make an effort. 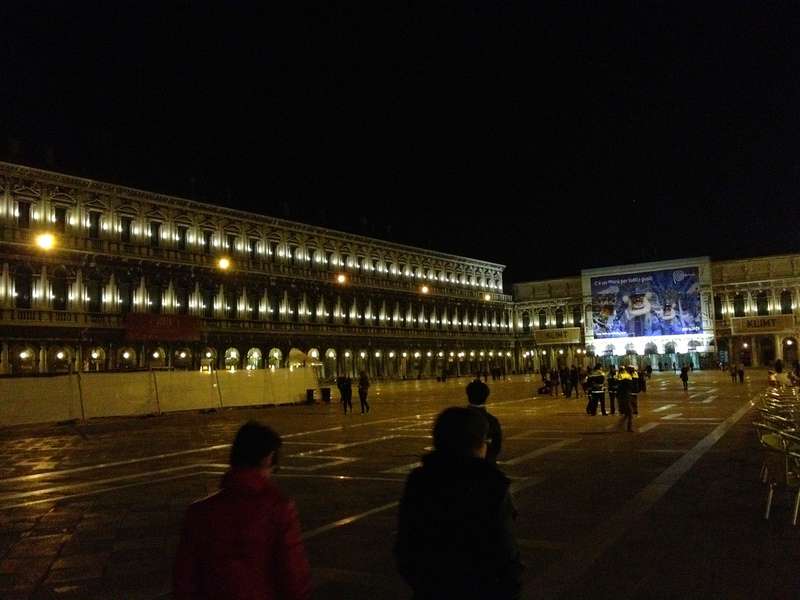 First we headed back to St Mark’s Square to see it lit up in its finery – a spectacular sight. 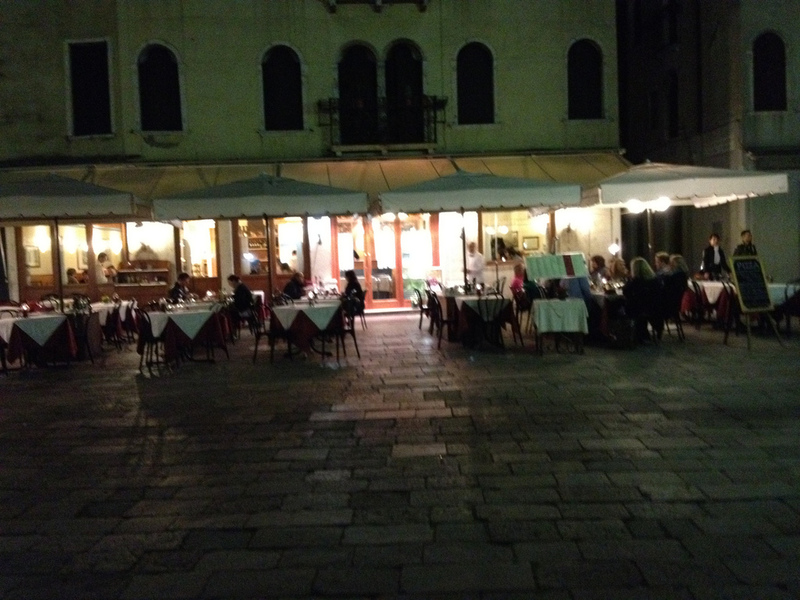 Then we eventually settled on the Osteria San Marco. 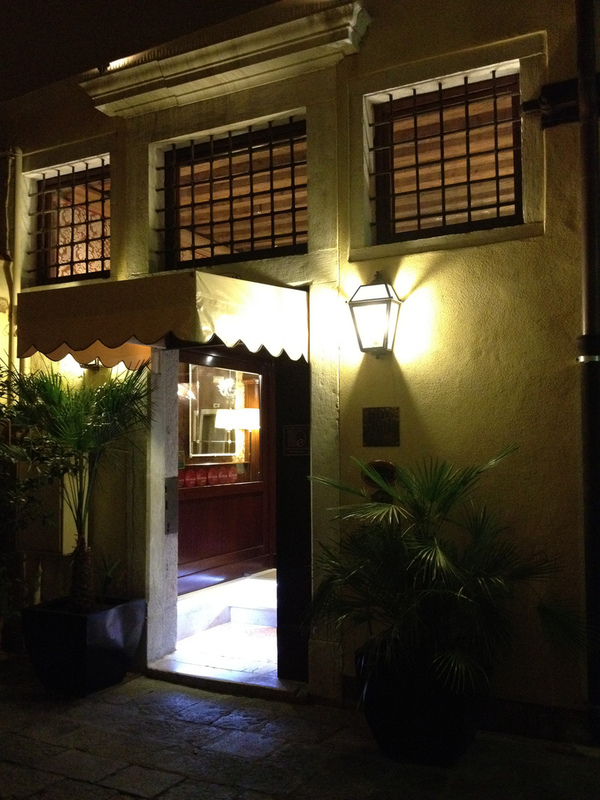 It’s a very welcoming little place and quite authentic, you feel. Our plan was to go there just for a drink first but decided the vibe was nice enough to stay. Not a great meal, but certainly good enough, and the three of us had quite sufficient to eat and a perfectly reasonable bottle of plonk for less than £100. 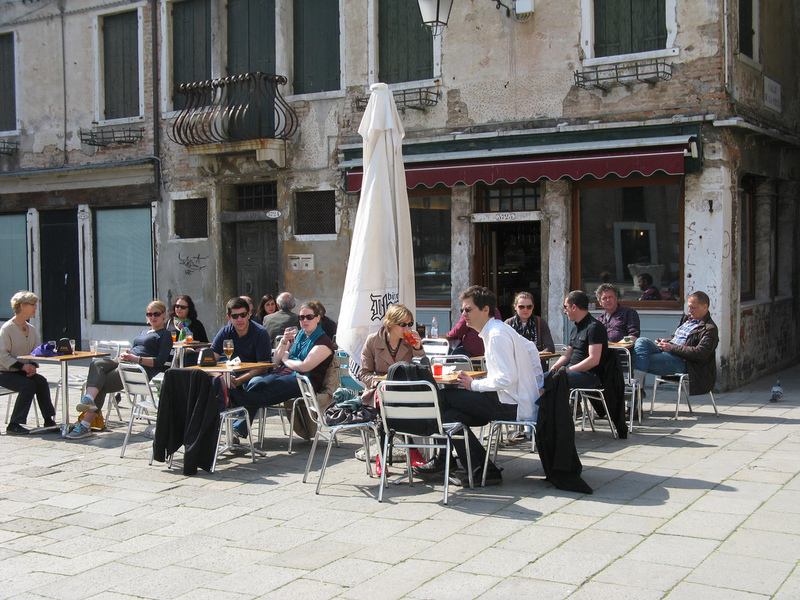 Day two in Venice – and the morning revealed the only weak link in the Duodo Palace’s chain – breakfast. To be fair the food itself was perfectly adequate, once we got it – but we had to wait a long while for a table to become available. The breakfast area is crammed into two small rooms and it wasn’t really comfortable. No doubt the hotel was full but the area given over to breakfast simply isn’t big enough. Not that it would stop me from returning – I thought it was a terrific little hotel. 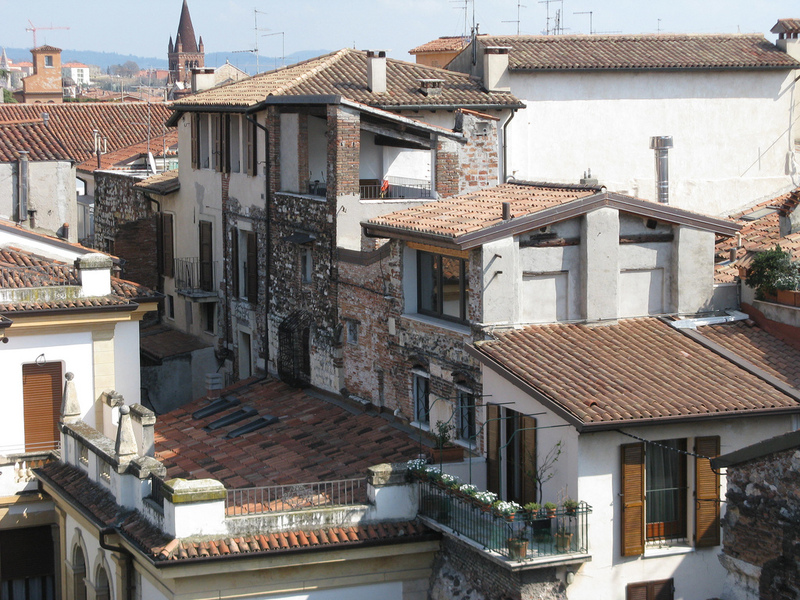 We thought we’d head out west and explore the Dorsoduro district. 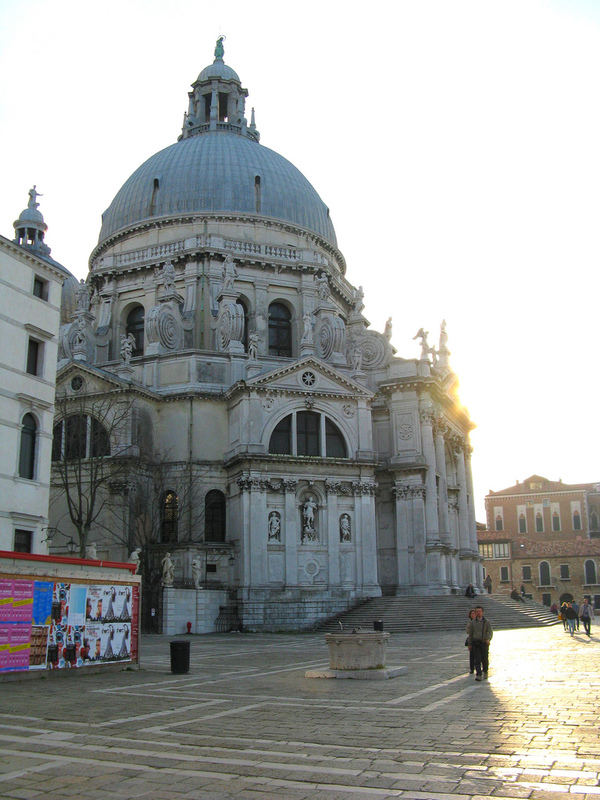 Venice is at its best when you simply go and walk somewhere. Deliberately get lost if you like, and just see what each corner you turn has to offer. 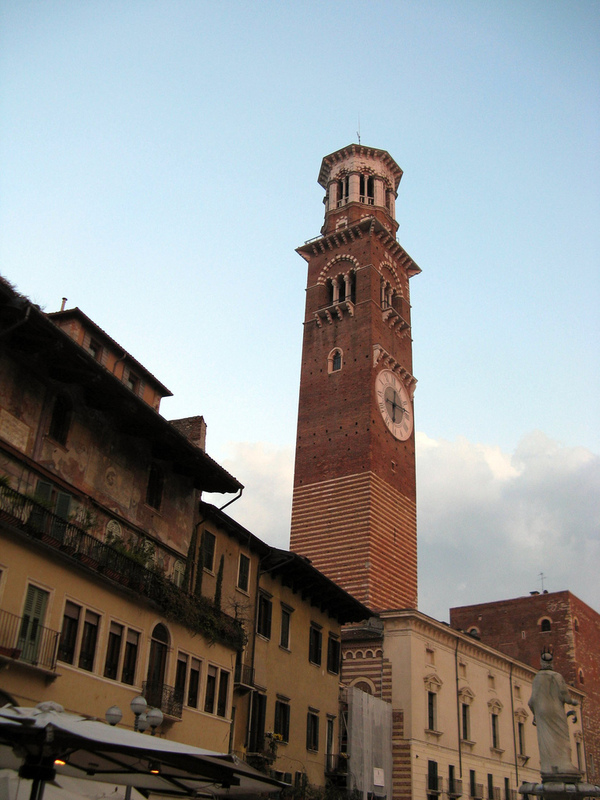 We discovered the Campo Santo Stefano, which was a charming square, with its elegant church to the side, which inside displays a painting of Pope John Paul II which looks more like Les Dawson. From there it’s a nice, relatively quiet, walk through to the bridge over the canal opposite the Accademia. 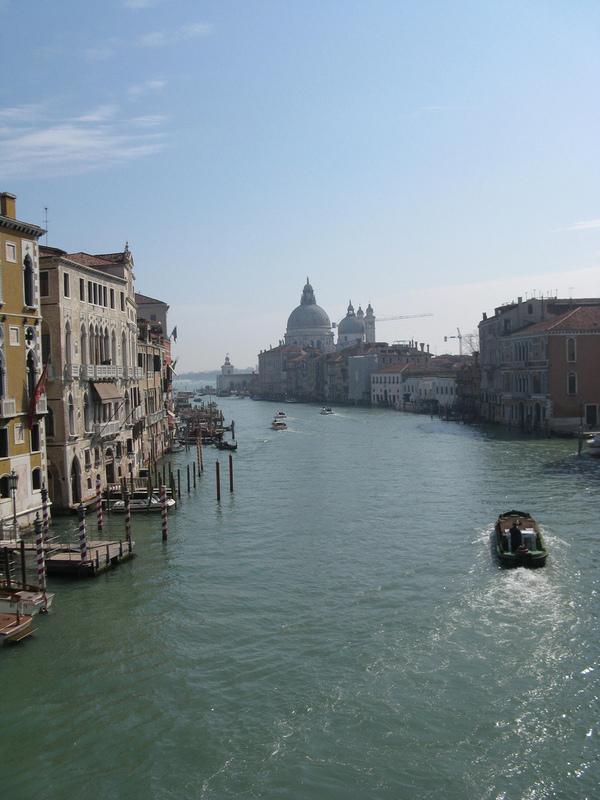 You have an amazing view from this bridge, every Venetian cliché you can think of is here. The bridge itself is teeming with people but eyeball a picturesque spot, stick to your guns and linger while you can. It’s lovely. Still heading west we discovered the charming little church of San Trovaso, kept walking along side little canals towards San Sebastiano church (for which we decided not to pay the entrance fee), Angelo San Raffaele, which was worth a short visit, and finally on to San Nicolo Dei Mendicoli which is a little stunner. You’re not meant to photograph inside but I’m afraid it was irresistible. It’s one of those little churches where not a scrap of plaster is undecorated. Absolutely beautiful. A much needed coffee break at a little café gave us the fortitude to head north east towards the Campo Santa Margherita. There we espied a little place that looked like it would be good for lunch later on. Interestingly the square had a few fish stalls and they must have been fresh because there was no smell at all. 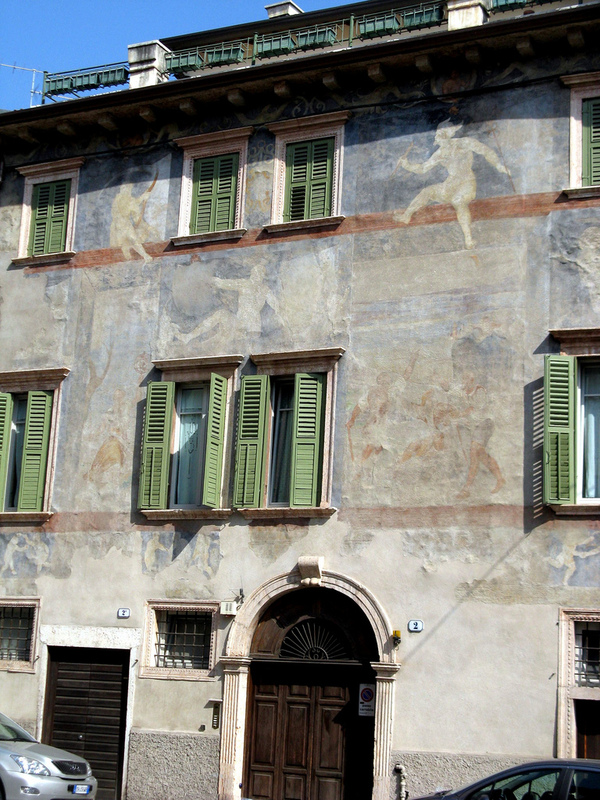 Further along, past San Pantalon, we carried on to what turned out to be a major highlight of our visit – the Scuola di San Rocco. Adjacent to the church of the same name, which is quite nice but nothing outstanding, the Scuola was originally a charitable confraternity. In 1564 they commissioned Tintoretto to decorate the walls and ceilings, which you could say was a wise move, with the benefit of hindsight. The ground floor is stunning enough but upstairs is breathtaking; a vast salon of incredible artwork where you could spend hours – it’s definitely a must-see in Venice. There was a small film crew there too, filming a young couple meeting outside and then walking in to the building. If they did it once they did it twenty times. They might have been Italian starlets. Who knows? 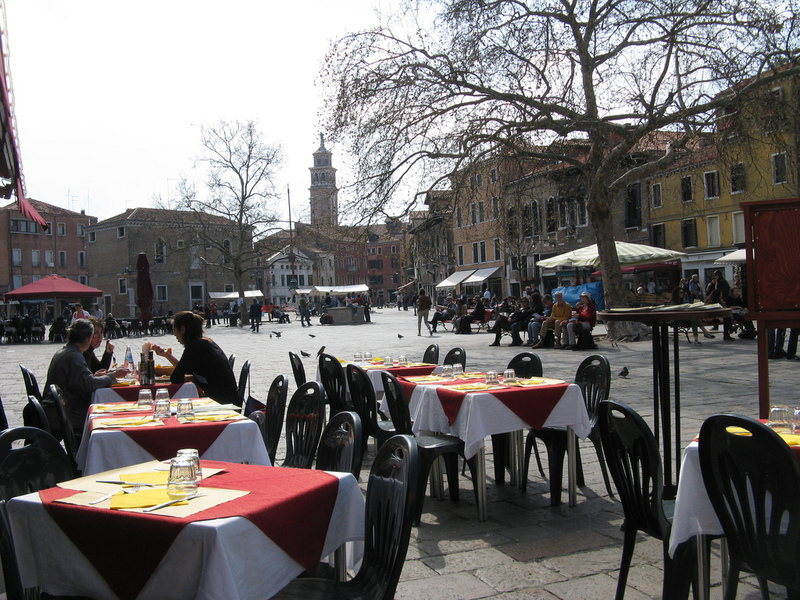 It was without doubt now time for lunch and we did go back to that place on Campo Santa Margherita for lunch – Pier Dickens. Just a pizzeria, but probably the best meal we had in Venice, as it wasn’t trying too hard and the food was pretty darn good. All in a lovely, not too touristy location. Really recommended. Time for a bit more culture so we called at Ca’ Rezzonico, an old palace that houses a museum of 18th century Venice. 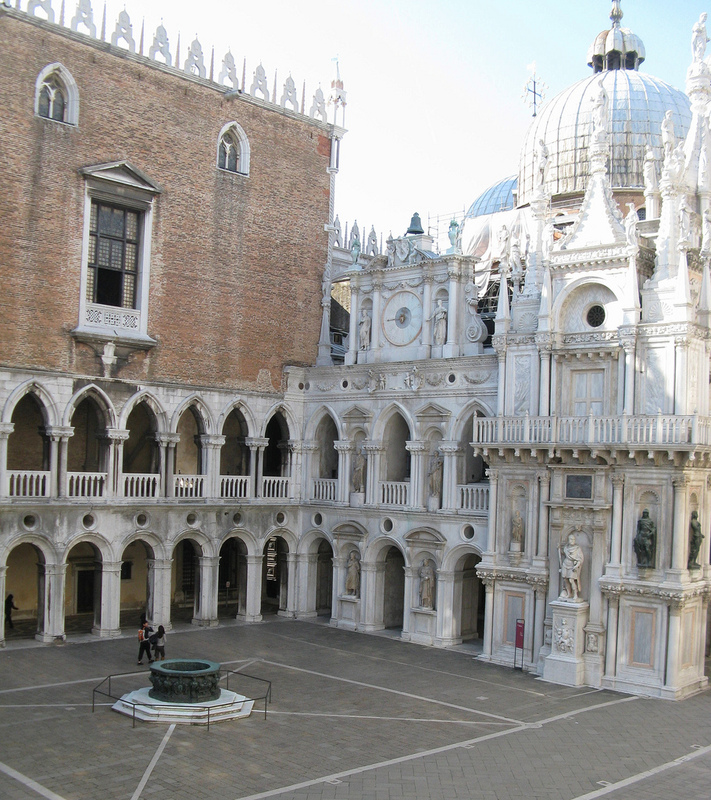 It belonged to Robert Browning, and his son Pen, and is worth a visit to get a feel of the time and to enjoy being inside a typical Venetian palazzo. It’s notable for the extravagant (if perhaps surprisingly smallish) ballroom. 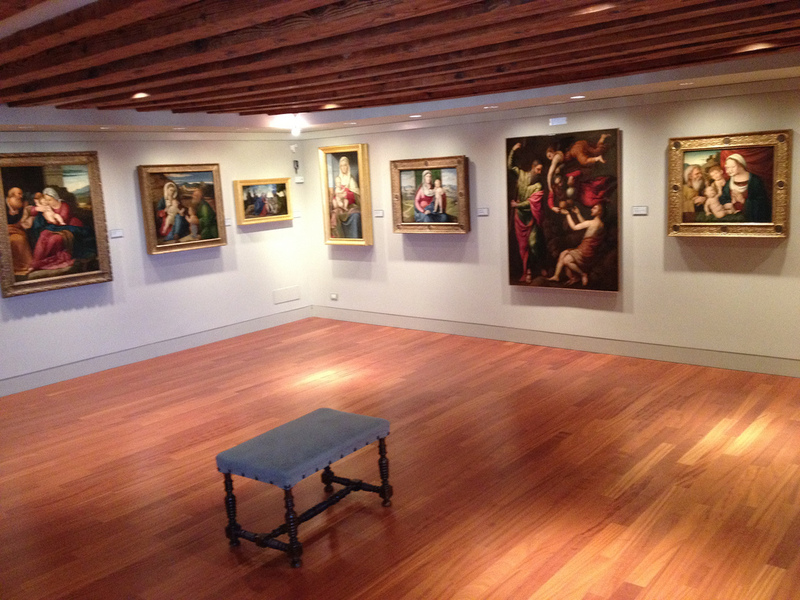 Upstairs are some new art galleries and I must say I found the art on display there rather fresh and stimulating. Needing to get outside after all that art, we wandered back towards the Accademia but then carried on to the end of the promontory where you find Santa Maria della Salute church. It’s a rather unusual shape – an octagon; quite grand on the outside, slightly workaday on the inside. But from there you have spectacular views back over towards St Marks Square. We walked right to the end of the promontory and were surprised at how windy it was! And that really was quite enough tourism for one day. On the way back to the hotel we found a little pub. Unpretentious and simple, it wouldn’t have been out of place in Stratford on Avon. Can’t remember it’s name, but it was perfect. After a much needed nap, we went out on our usual forage for food and drink. We decided to start off at Caffe Brasilia, very informal, quite expensive, but comfortable, friendly and much used by locals. Good for pre-dinner drinkies. For dinner we chose the Ristorante San Stefano, which was a complete tourist trap and offered a lazy, uninspired, barely adequate, expensive meal. Never mind, some you win, some you lose. 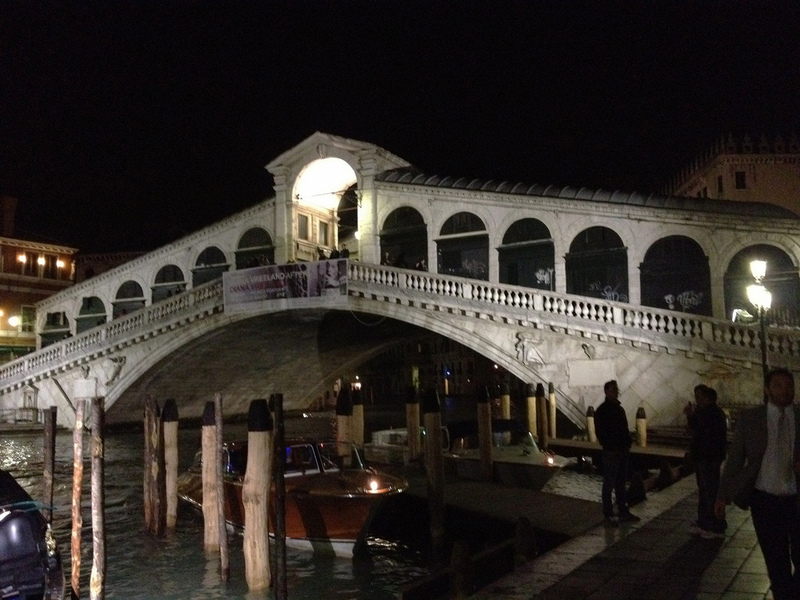 Too early for bed, we decided to do a nighttime walk to the Rialto Bridge. Nowhere is that far away from the San Marco district and we were surprised how quickly we got there. It’s definitely a tourist attraction at night – heaving with people it was, but with a good friendly vibe. Rather like the Ponte Vecchio in Florence, the Rialto still has its shops on the bridge, and it’s another must-see. Having retraced Shylock’s steps, we returned to the St Marks area, looking for one last place for a late night drinkie. We found a nice little place, just to the side of St Mark’s Basilica; full inside but it was mild enough (just) to sit at the pavement tables and drink in the atmosphere and Chianti. We were happily sat supping away when a bunch of clean cut American youths appeared and basically asked the waiter if he would give them something to eat if they sang. Intrigued, the waiter asked to hear them at work – and then these lads suddenly came out with the most wonderful a cappella music, totally unexpectedly. The waiter was impressed, and they got some pasta. The odd things you see on your travels! The next day was to be the start of our cruise adventure, but we still had a free morning in Venice, and had no wish to miss out on any of it. 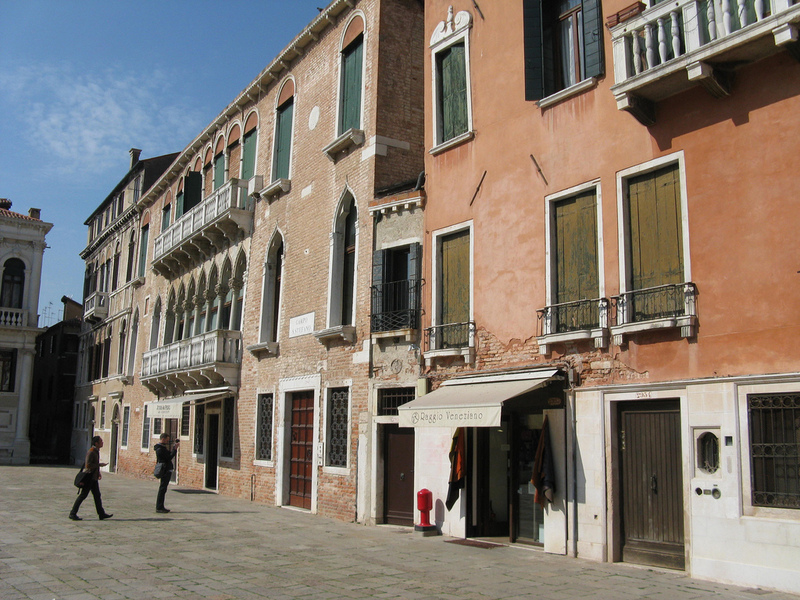 So we headed east from the hotel, past St Marks and the Doges’ Palace, into the Castello district; a charming network of narrow canals and even narrower alleys; nothing especially outstanding or beautiful, but overwhelmingly picturesque taken as a whole. Mrs C and Lady D plundered a couple of jewellery shops – considering the location, they got some really nice stuff at very low prices. We wandered past the Campo San Martin and ended up near the San Giovanni in Bragora church, having a light early lunch in a simple authentic little café, on the corner of Calle de la Pieta and Calle del Dose. Refreshed in the sunshine, it was time to head back to the hotel to catch our water taxi to the Passenger Terminal. Yes, yet another water taxi ride; each one a different kind of bliss. 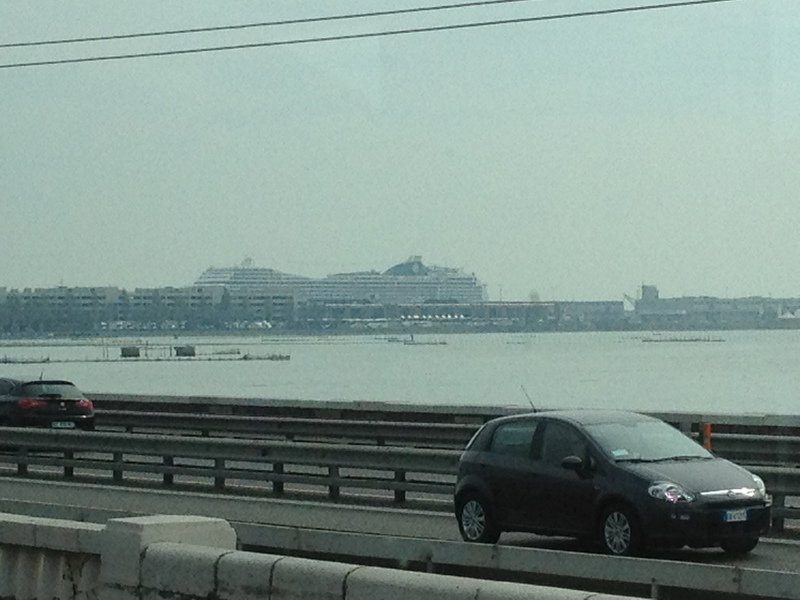 It was a really splendid way of arriving for a cruise, speedboating alongside the liner as you headed for the shore. I’d really recommend it! 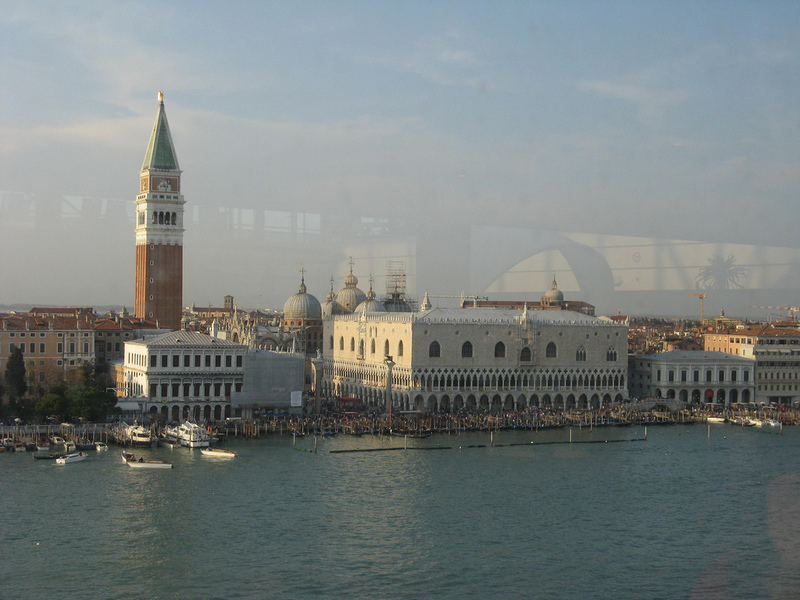 Later on, when the cruise ship finally gets going and leaves Venice, you are treated to the most amazing view. The height and distance of the ship is just perfect for the grandeur of St Marks Square from the water. Admittedly we were a bit late in staking our perfect spot for the view so had to watch through a window but it was still glorious. A wonderful way to say goodbye to Venice and to look forward to the week ahead. We would have one more morning in Venice at the end of the cruise before getting the train back to Verona for our flight home. 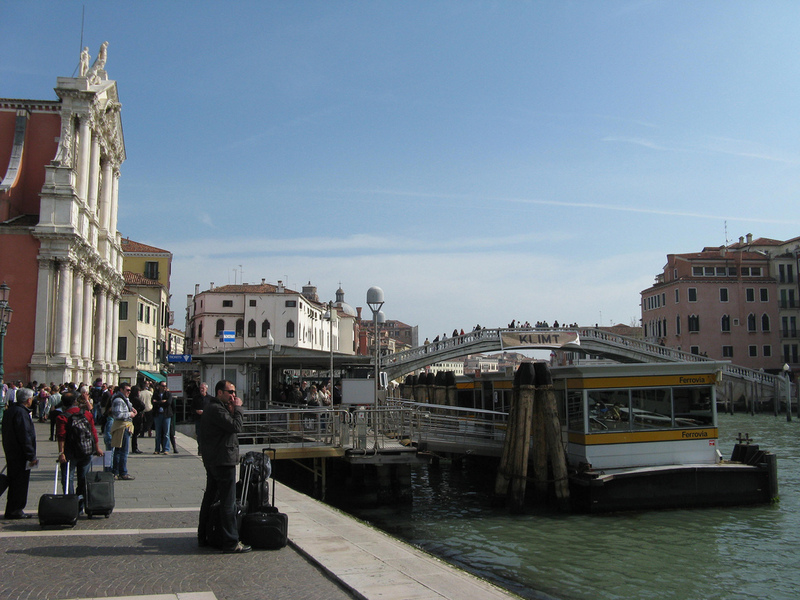 Getting from the ship back into Venice “town centre” was an adventure in itself. Doing what I would never normally do, I responded positively to some bloke meeting the ship offering people taxis to the railway station. With “safety in numbers” in mind, I was grateful that another couple also eventually consented in the same way. After a very long wait we were finally escorted to a very decent looking taxi that did indeed take us to the railway station for 10€ each. But what a strange route! Through industrial zones, over railway lines, opening barbed wire gates, backs of farms… hardly any of it properly tarmac’d. The thought did drift through our minds that we would be all found as skeletons in some lime pit in fifty years time, but of course we were safe. The Left Luggage provision at Santa Maria station works fine, so unencumbered we were able to saunter back into the Saturday throng. 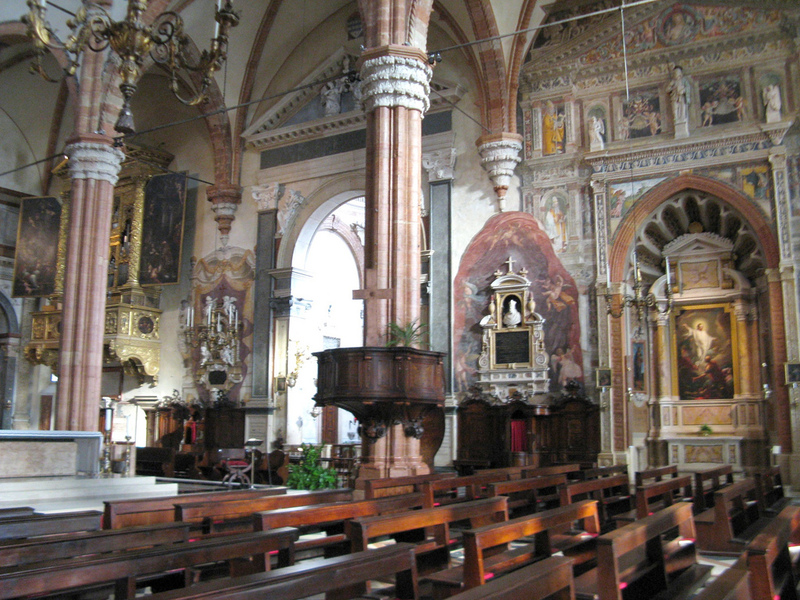 We started off inspecting the elegant interior of the Scalzi church next door to the station. It’s amazing how many of these small churches are as opulent as any cathedral. 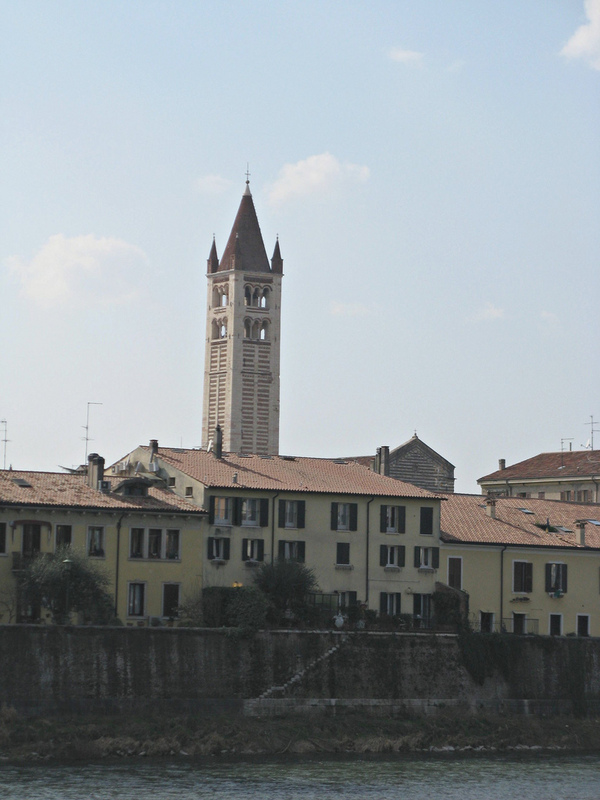 Then we crossed the nearby bridge and lost ourselves in the Santa Croce district. 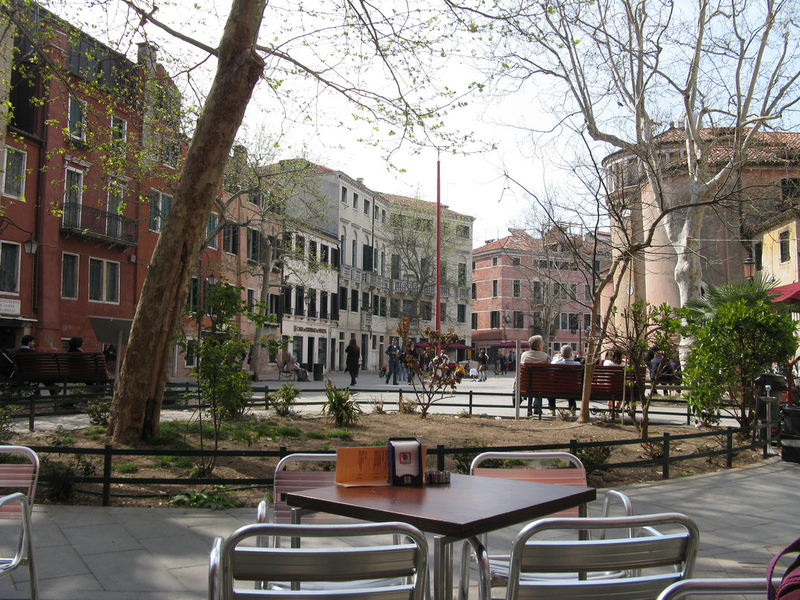 In desperate need of a coffee we found a nice little place on the Campo San Giacomo dell’Orio with swish toilets and an ace view of the piazza. 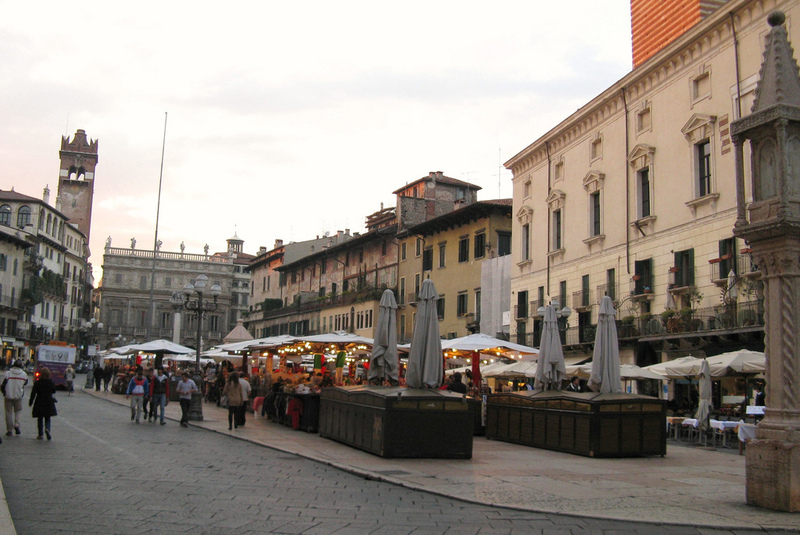 Then we continued to the Campo San Polo with its super campanile and fun lion statues. 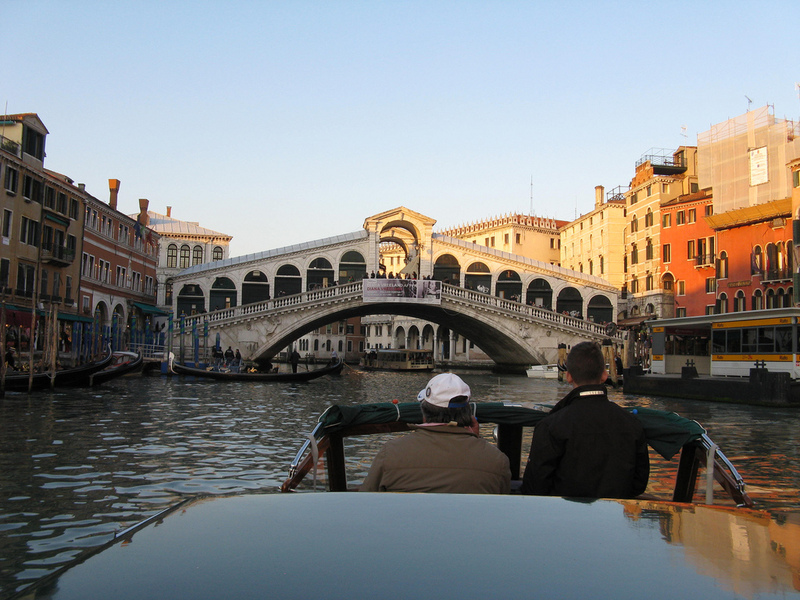 Our goal was to check out the Rialto by day, having only seen it at night before. And we made it with ease, to find out it was equally busy as it is at night. With all the shops and markets open it’s a really lively area to waste an hour or two – which we didn’t have, unfortunately. We popped into the rather bizarre little church of San Giacomo di Rialto, which basically seemed given over to the sale of concert tickets; and then joined everyone else posing for photos on the bridge itself. Time was against us, and we needed lunch, so after a couple of false starts we found a little restaurant on the Strada Nova. I can’t remember its name now which is probably just as well. The wine list was a board outside that advertised Pinot and Soave. Let’s have some Soave, I thought. When I ordered it, the waiter seemed perplexed, as though no one had ever done that before. He went away and brought the Maitre d’ (quite a posh name for the kind of guy he was in all fairness). “I recommend the Pinot”, he said. “I don’t think we have any Soave left, but I will *check* if you like” – in a tone designed to convey that it would cause him enormous inconvenience. I held my ground and let him be inconvenienced. He returned saying we were “in luck, and there was one bottle left”. He left it to his little mate to open the bottle and serve. I noted the age of the wine – 2007. That’s a bit old for a Soave, I thought. He poured a small taster into the glass. It had a colour best described as “first urine of the day”. It was repulsive. Mine host knew full well it would be. “May I suggest the Pinot then sir” was his rather barbed defence. Pinot it was. The meal was fine actually, and the wine experience humorously bizarre! Why didn’t he just say, in best Basil Fawlty tradition, “sorry, Soave’s off”? We made it in good time to get back to Santa Lucia station, reunite ourselves with our luggage and get our train back to Verona; our final lovely 1st class Trenitalia experience. On arrival we decided to get the shuttle bus from Verona station to the airport, which worked fine – we just bought the tickets from the tobacconists inside the station complex. But it dawned on me afterwards that with three people a taxi to the airport – of which there was a plentiful supply – would have been cheaper and quicker. No worries. The plane was late; and Verona airport is a bit of a boring place to be fair. But we’d had a fantastic time away. However, gentle reader – this is not the end of this story; oh no, you don’t get away with it that easily! What happened on the cruise itself is a tale yet to be told….